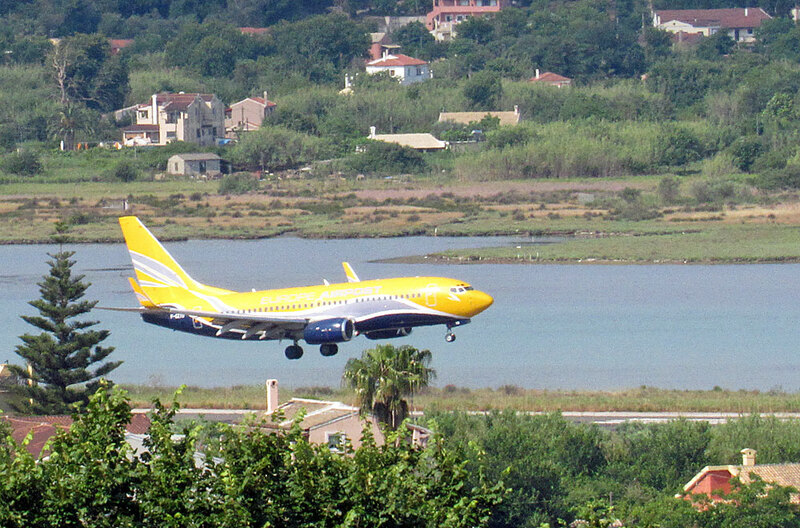 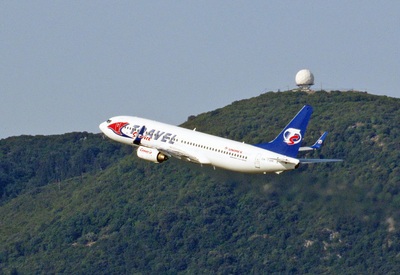 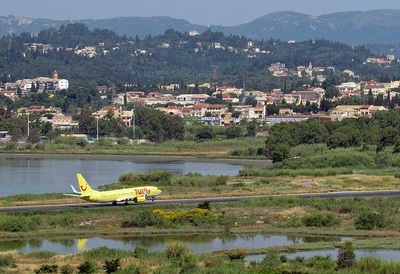 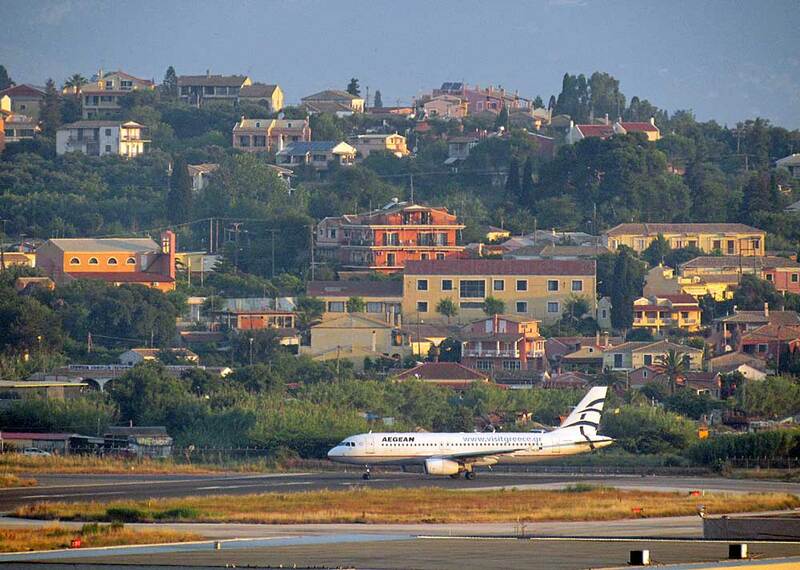 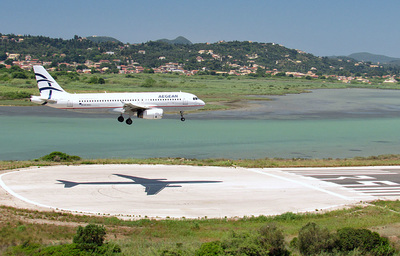 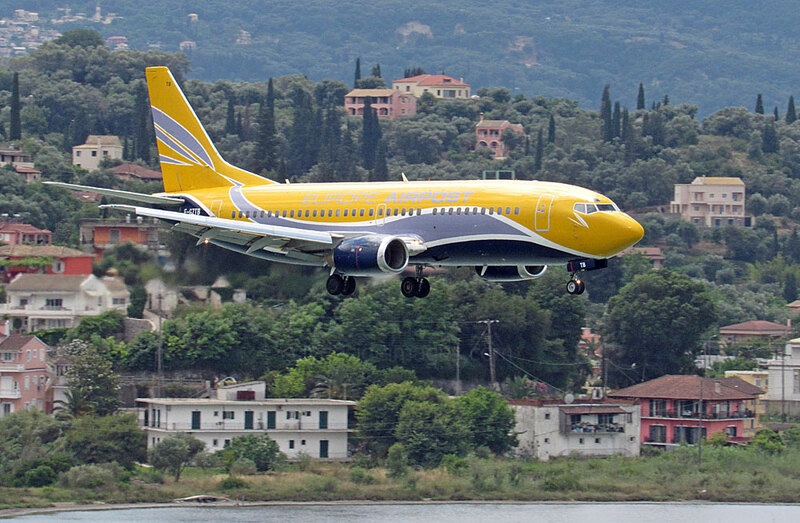 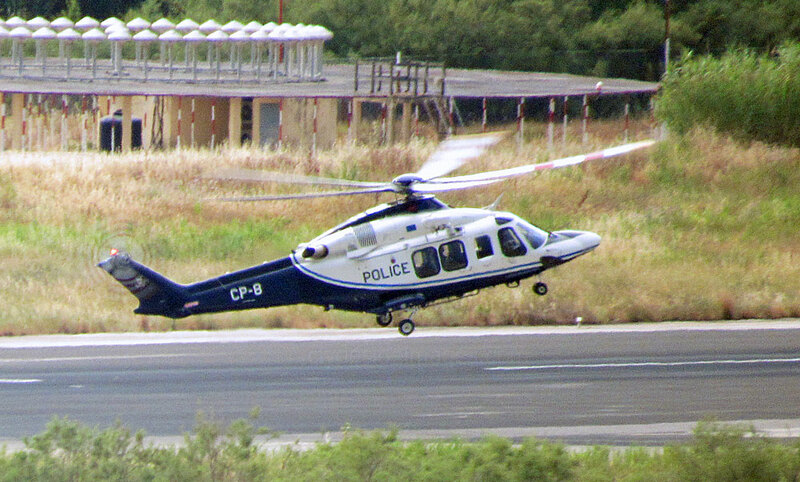 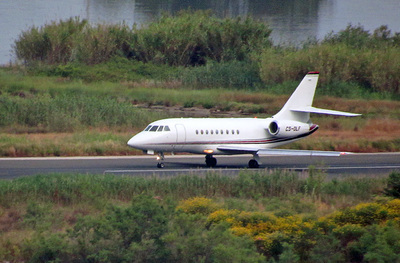 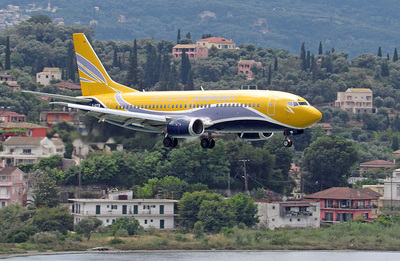 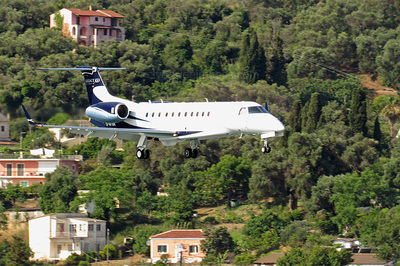 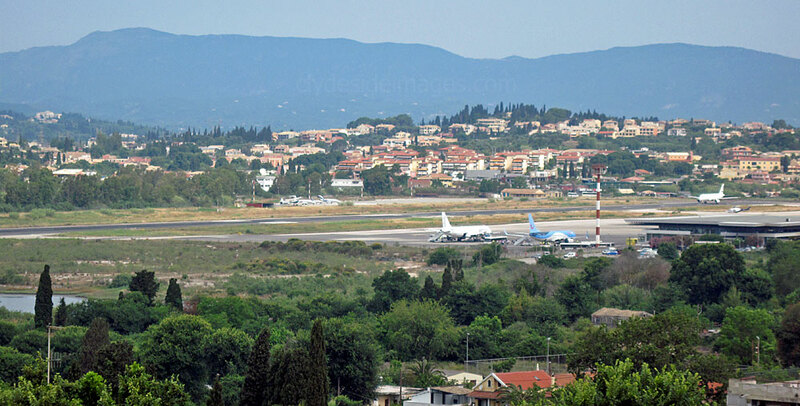 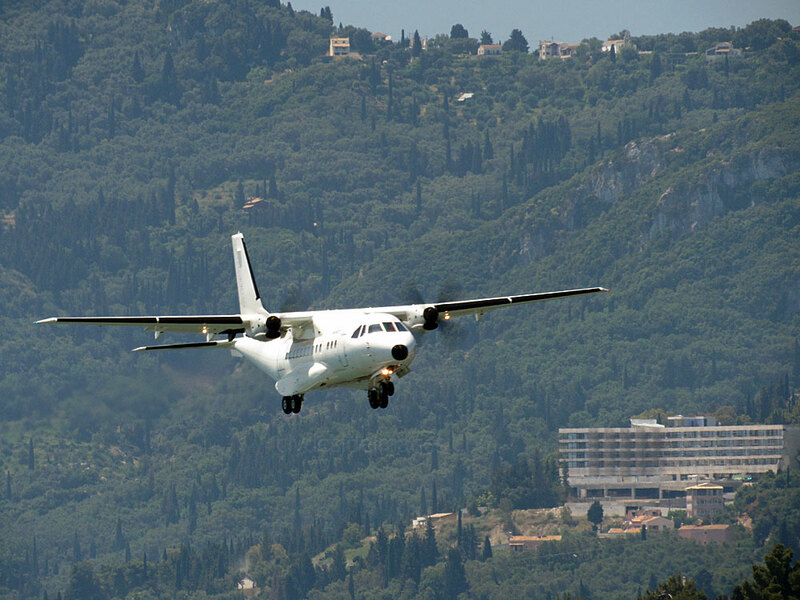 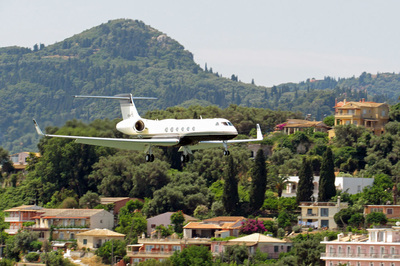 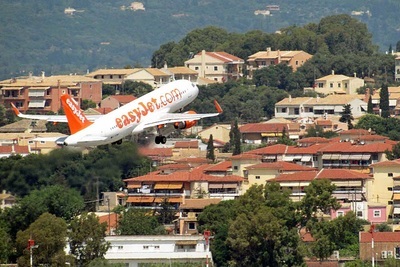 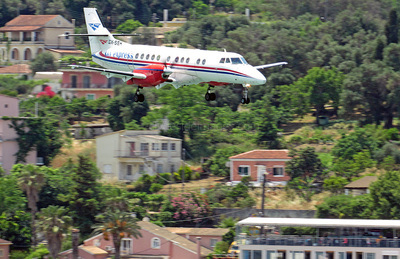 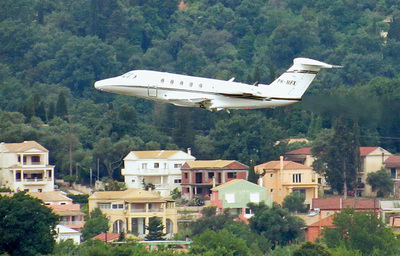 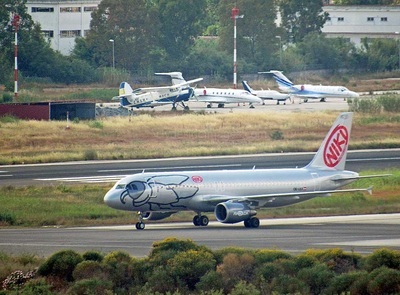 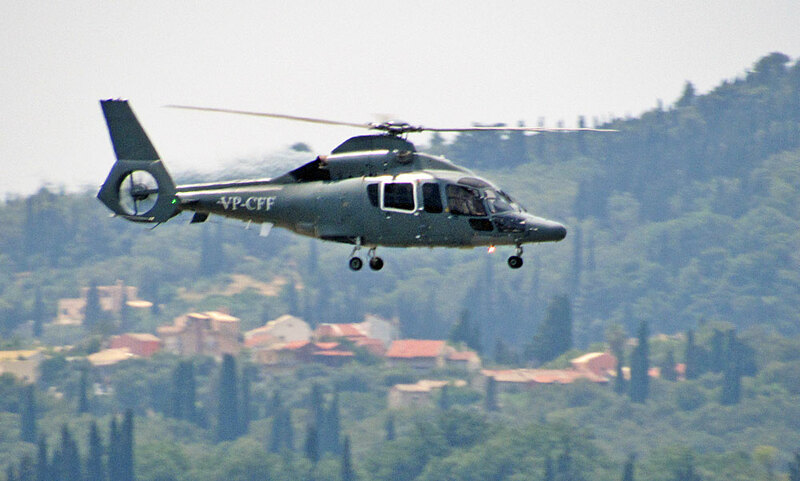 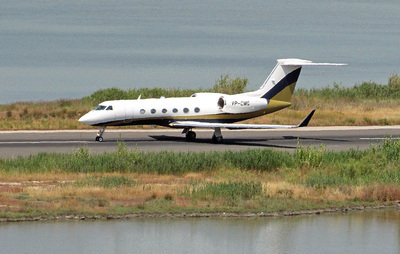 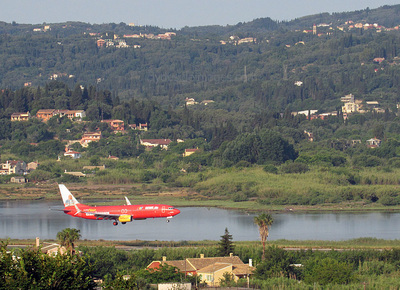 Base for a week-long stay in June 2015 was the Divani Corfu Palace Hotel (above) which is situated around 1km north of the better-known Royal Boutique Hotel and adjacent tavernas, all of which are recognised in aviation enthusiast circles as excellent vantage points for photographing aircraft. 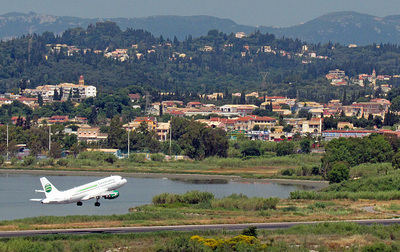 The Divani is one of several holiday properties in an elevated position parallel to the runway which look directly onto the international airport. 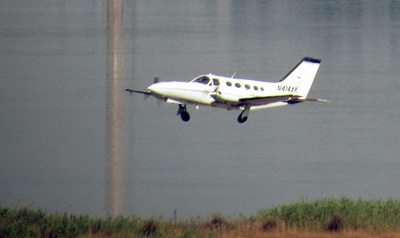 I was travelling light again, with my bridge camera rather than my Digi-SLR, therefore some of the distant shots here are a bit grainy. 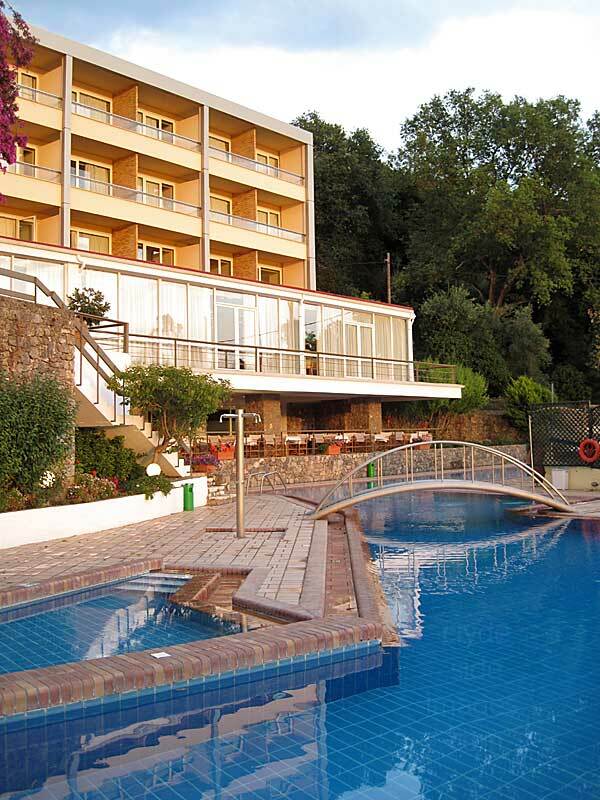 With regard to the Divani Corfu Palace Hotel, I couldn't fault it - the staff were friendly, the room very comfortable and clean and there's a nice pool area. 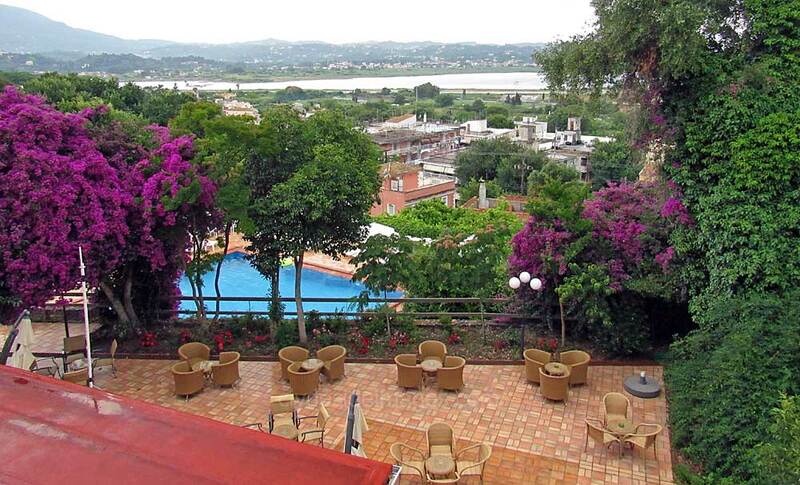 Air-conditioning, WiFi and a safety deposit box are all provided free of charge and the buffet breakfast was excellent. 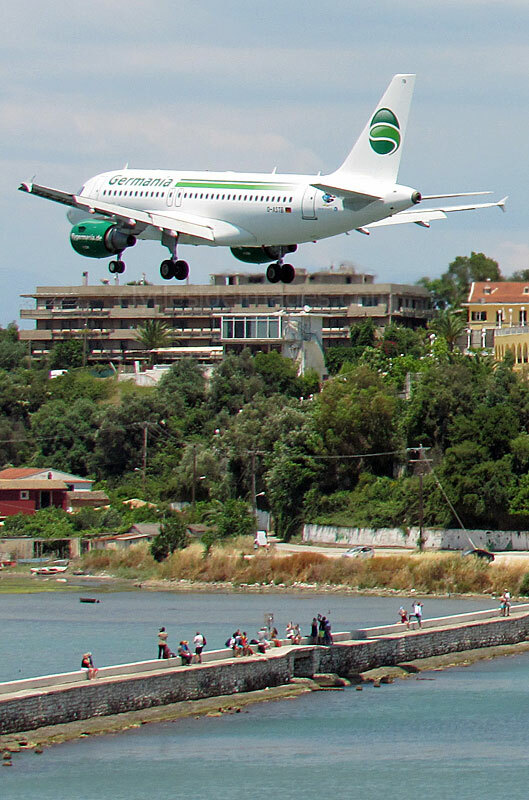 Aircraft noise wasn't an issue but I imagine this may be more noticeable for anyone staying at those hotels closer to the south end of the runway. 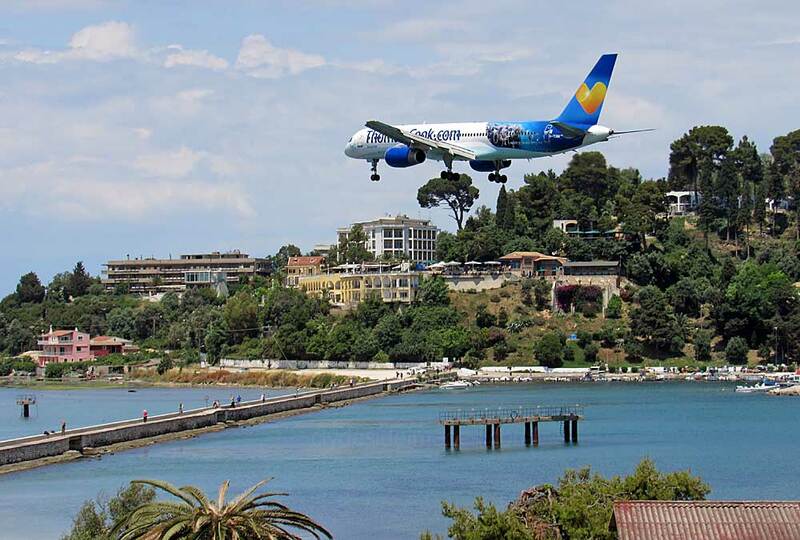 Although Captain George`s doesn`t offer views of the approach or runway, it comes highly recommended. 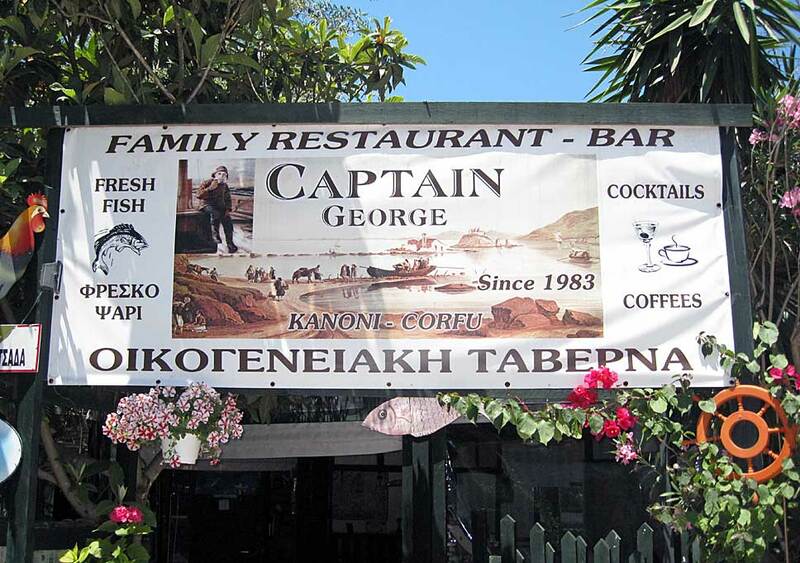 Traditionally-cooked nosh at a reasonable price. 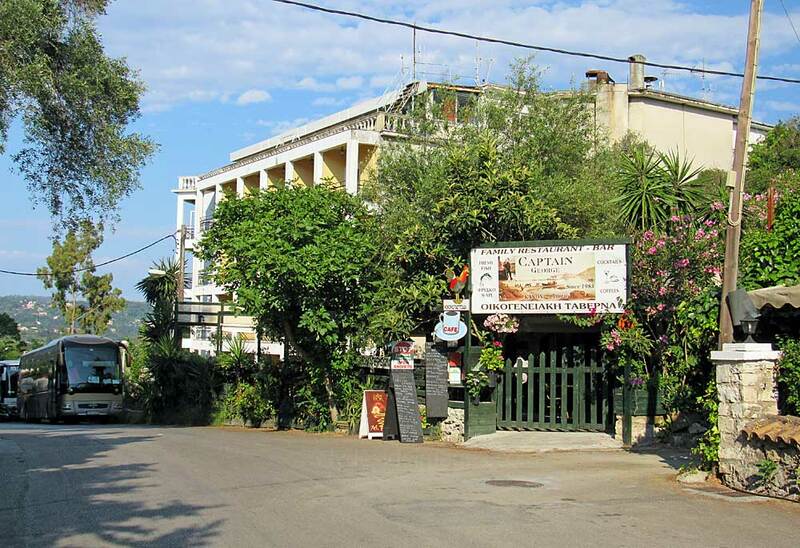 A couple of other small tavernas, situated nearer the Divani, well-rated in online reviews, are now derelict, apparently having fallen victim to Greece`s financial downturn. 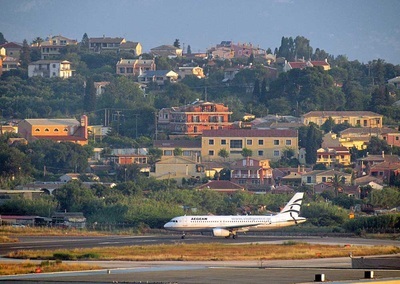 ​The Hotel Hellinis and Ariti Grand Hotel, situated between the Royal and the Divani, are other potential bases. 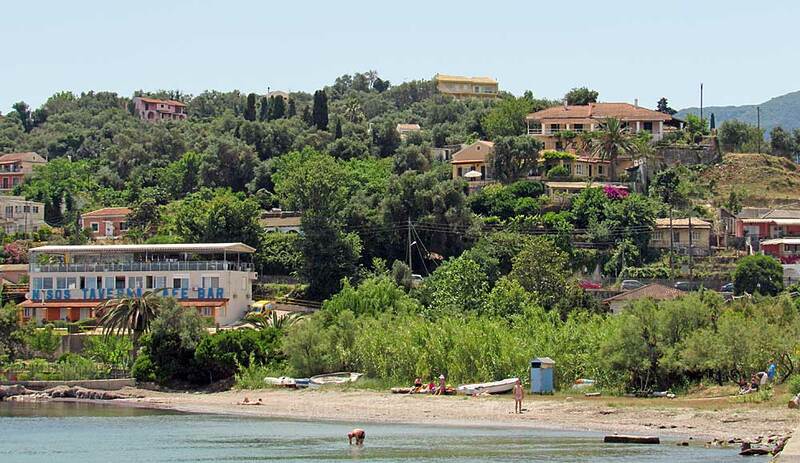 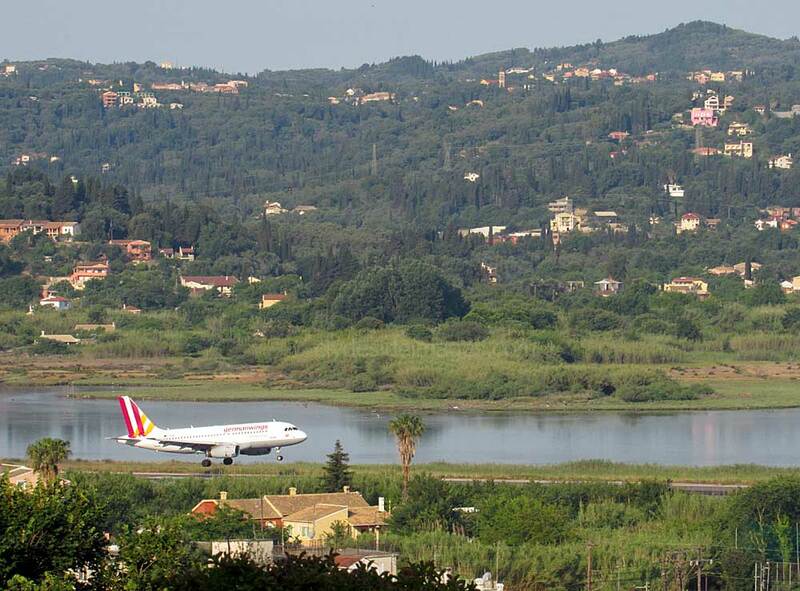 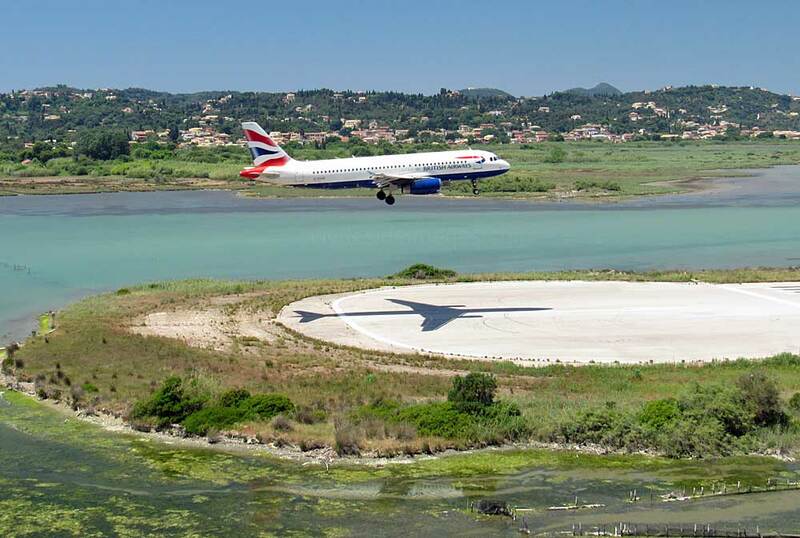 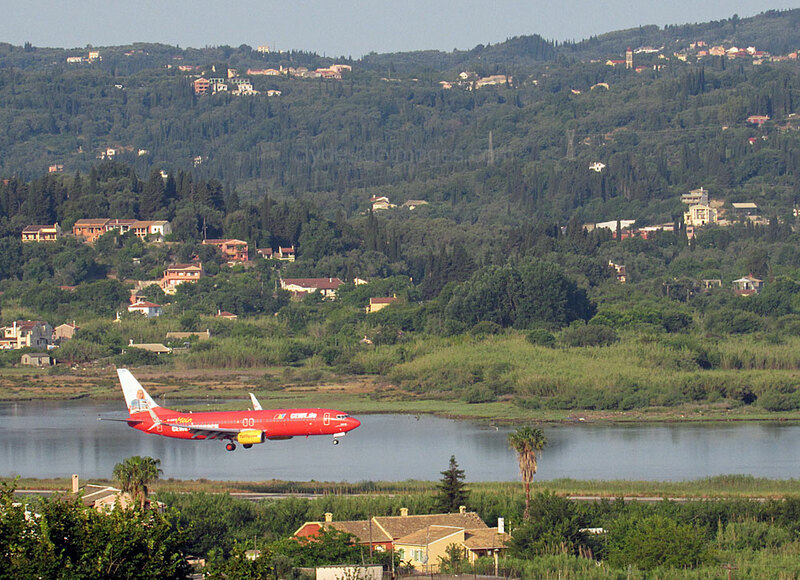 The holiday properties mentioned are all on the east side of the lagoon, very close to the south end of the airport's single runway, whereas the Divani, approximately 800 metres to the north, is set further back. 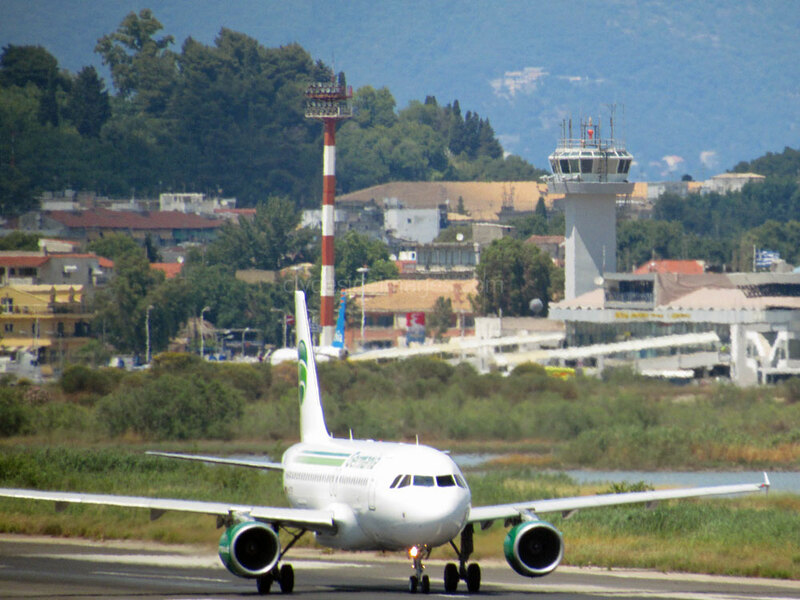 Although the Runway 35 threshold isn't visible from the Divani Hotel, a long stretch of the airport complex is, including much of the runway, the control tower and the area around the main terminal, as well as an impressive mountain backdrop. 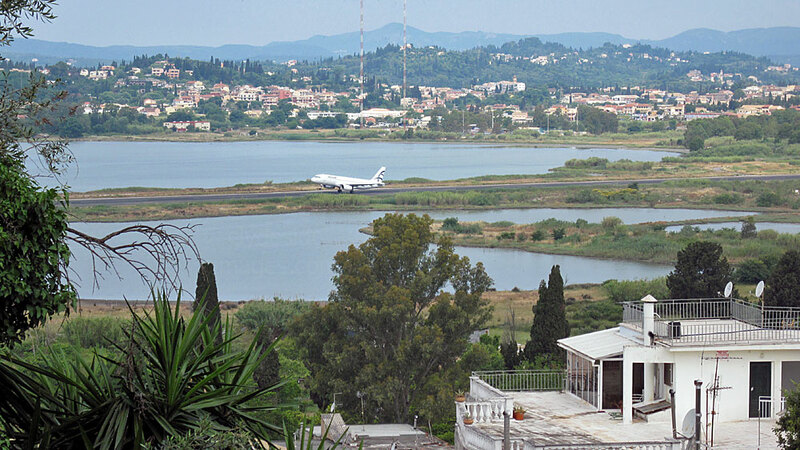 ​Our 3rd floor room (No.331) unfortunately had the hotel's only really tall tree right in front of the balcony but, despite this minor drawback, still enabled excellent views of landing and departing aircraft. 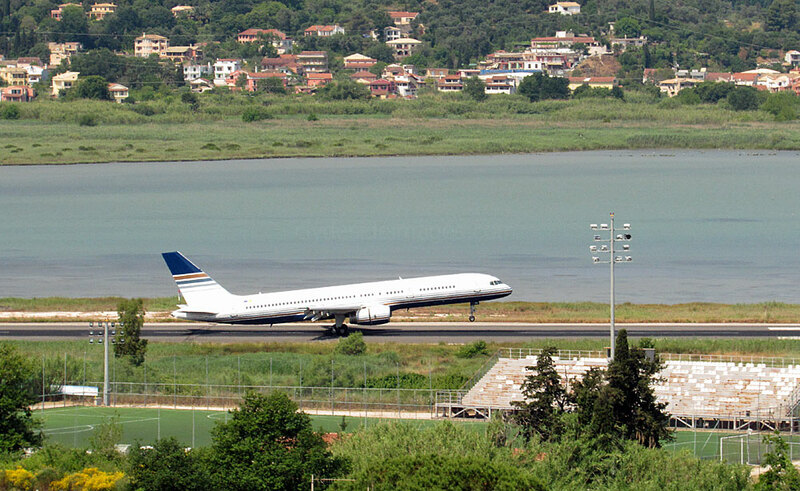 Any of the `lake-view` rooms in the 301-325 section should provide the best, unobstructed panorama from the Divani. Not being much of a sun worshipper, I was content to pass time on the balcony in the shade with a couple of beers and a book, ready to snap any action as it occurred. As well as landing and departing airport traffic, many high-level flyovers appeared overhead. 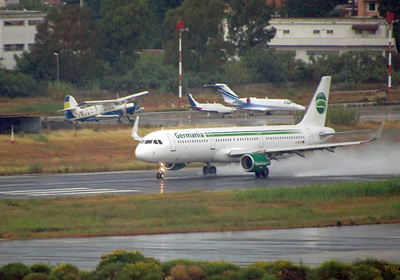 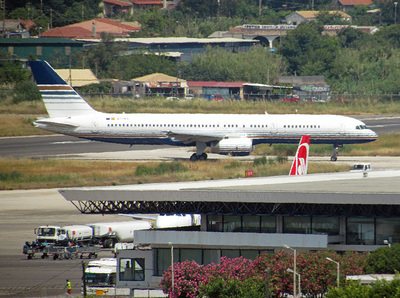 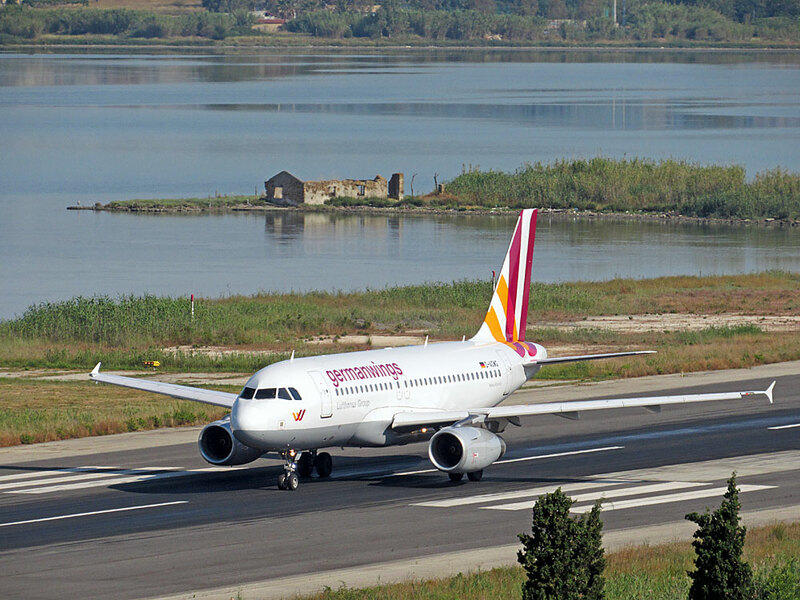 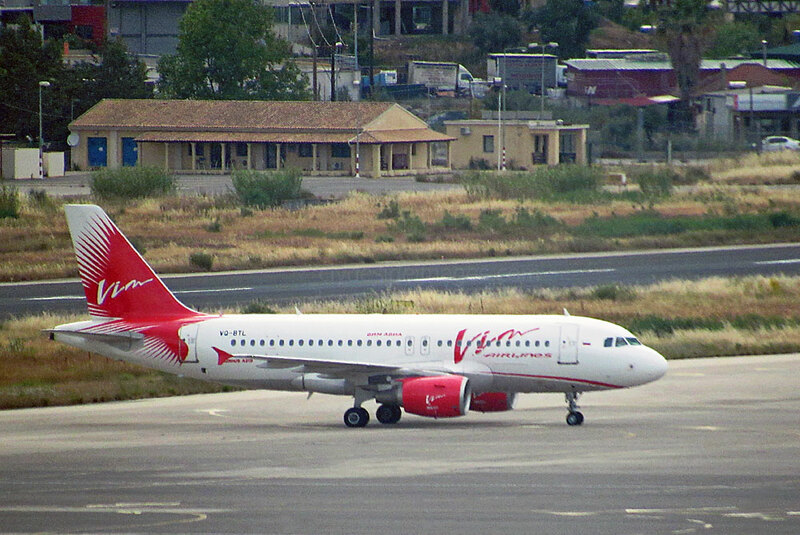 This view of the terminal building and Airbus A321-231 SE-RDO was also taken from the hotel balcony. 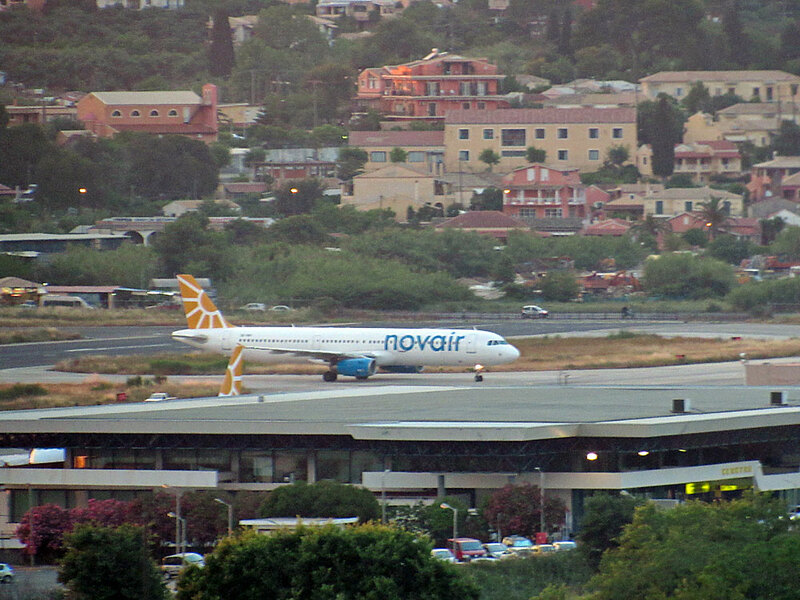 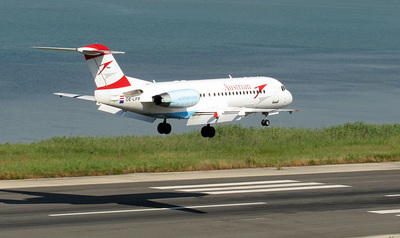 Nova Airlines AB, operating as Novair, is an airline headquartered in Stockholm, Sweden. 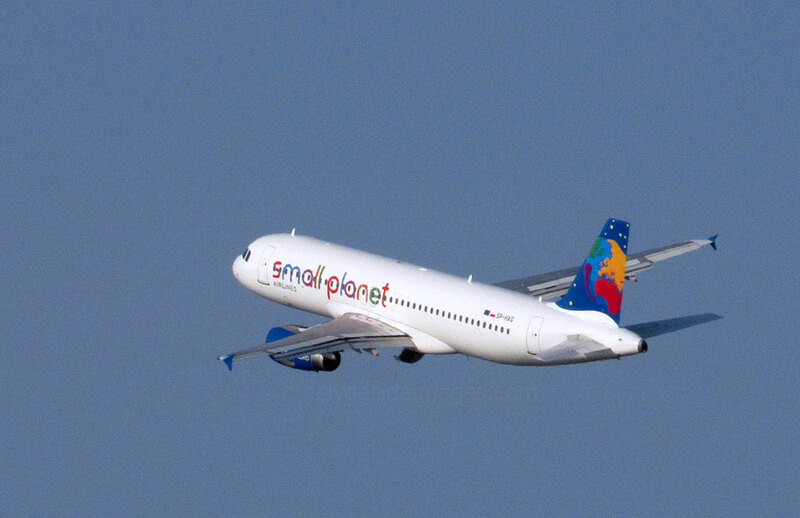 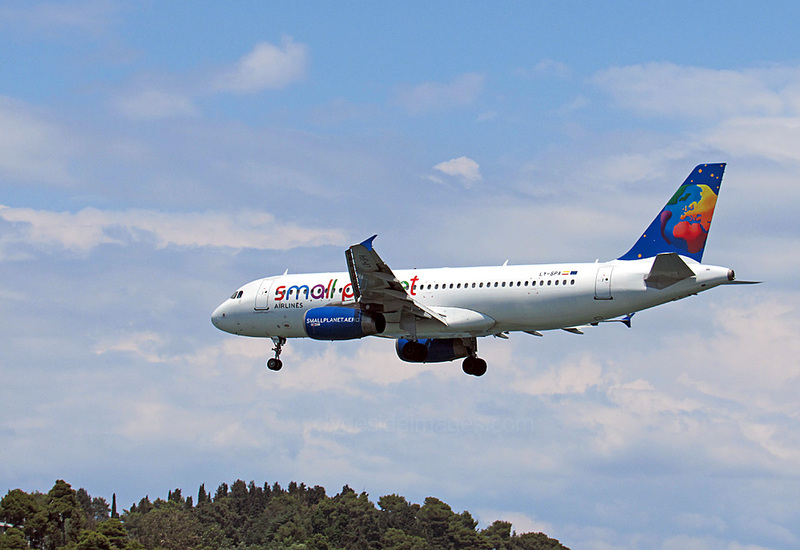 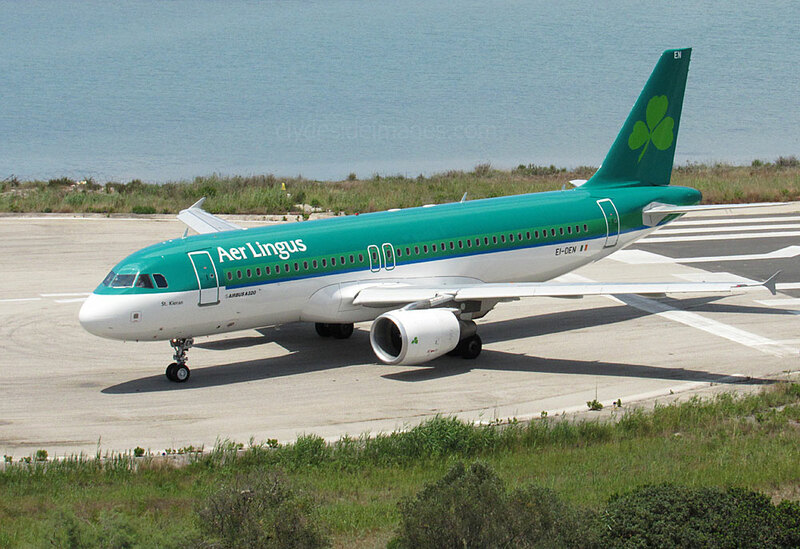 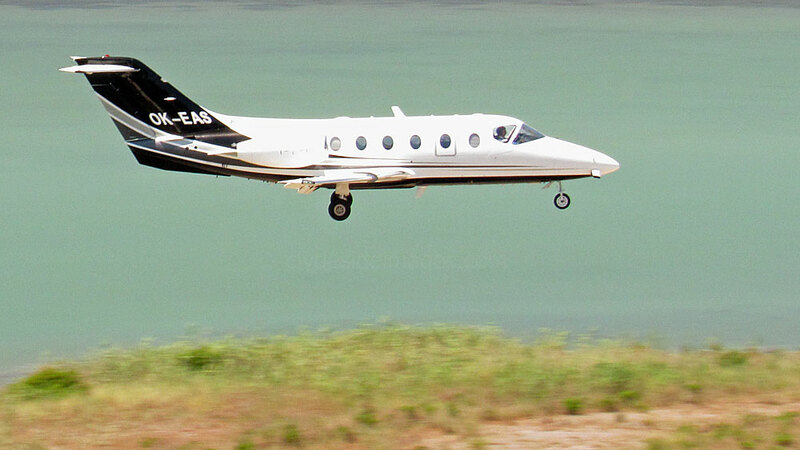 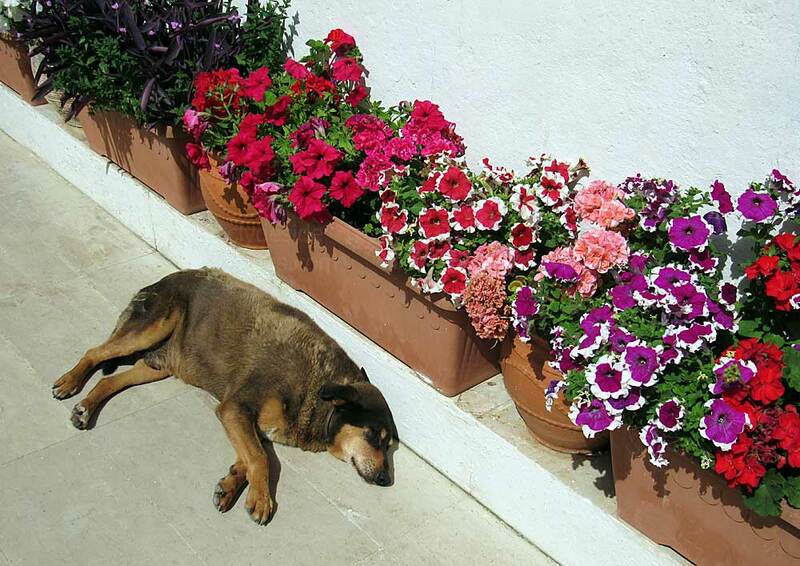 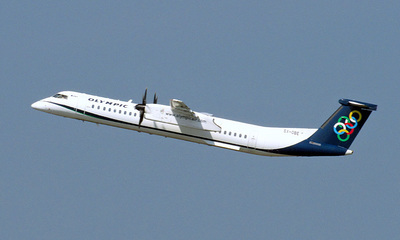 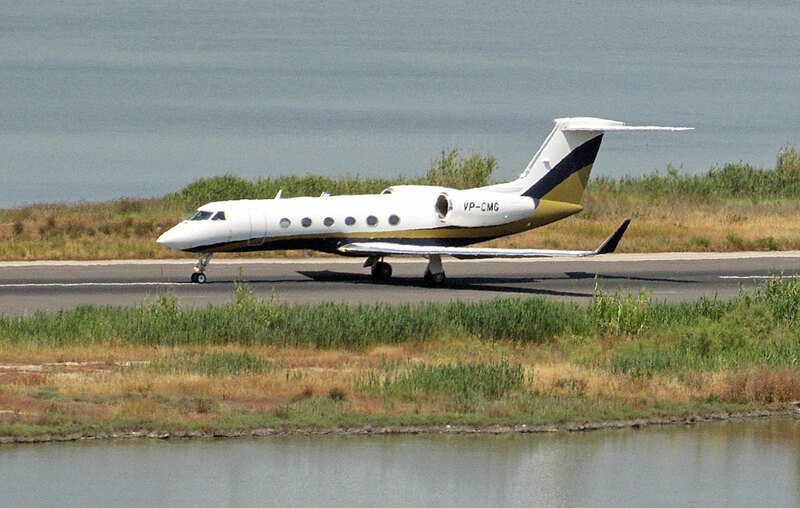 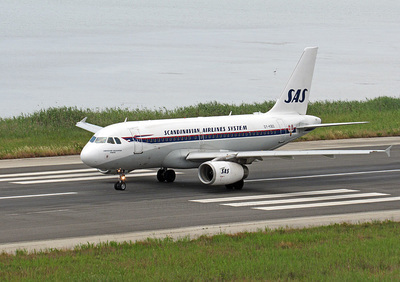 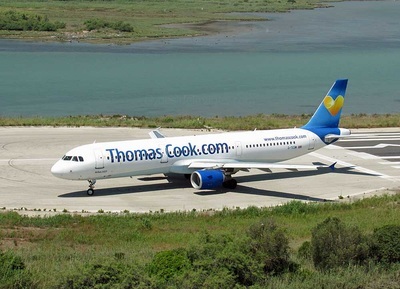 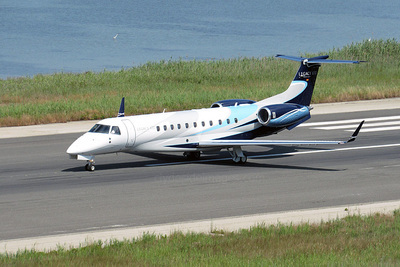 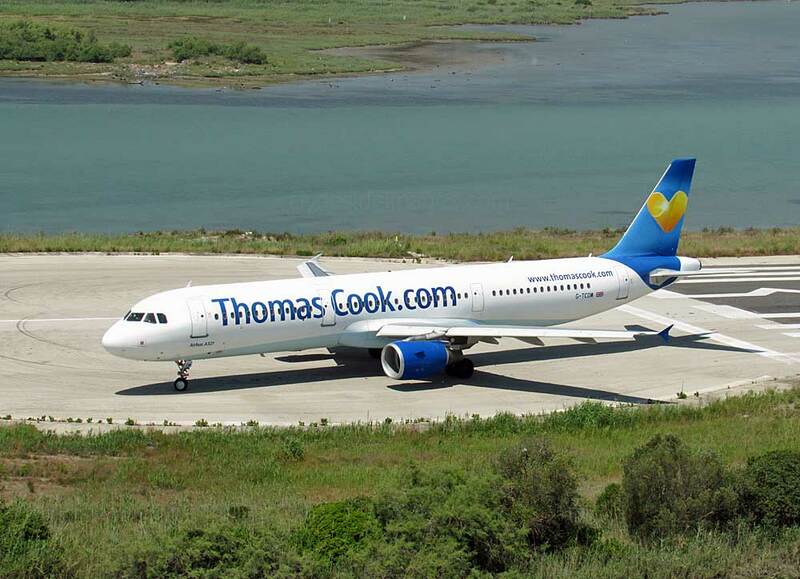 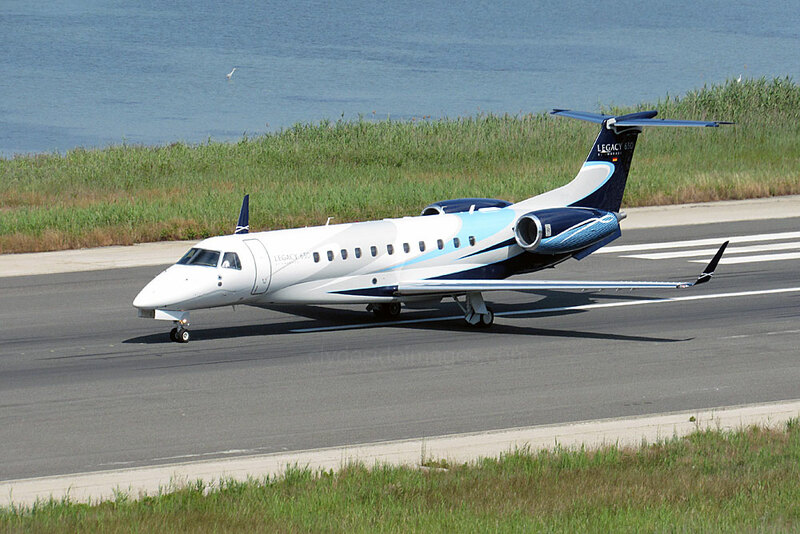 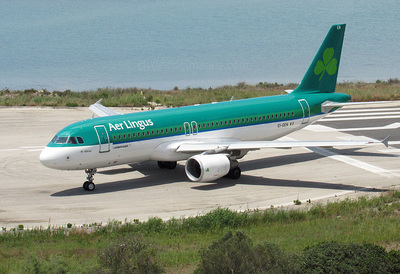 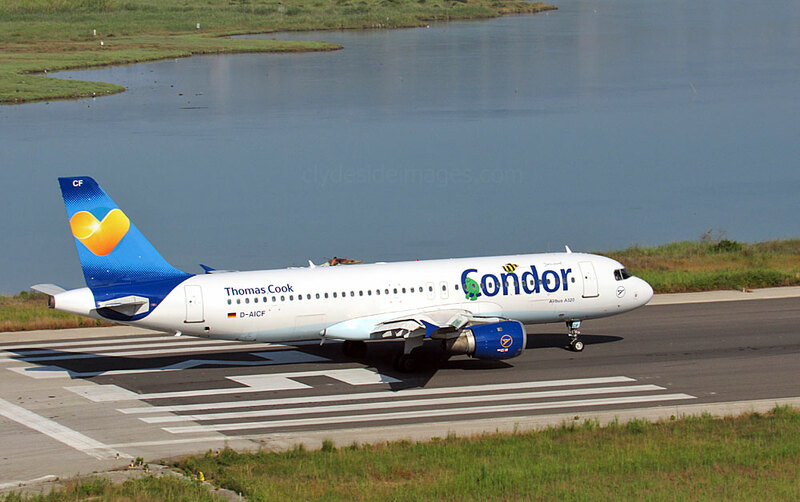 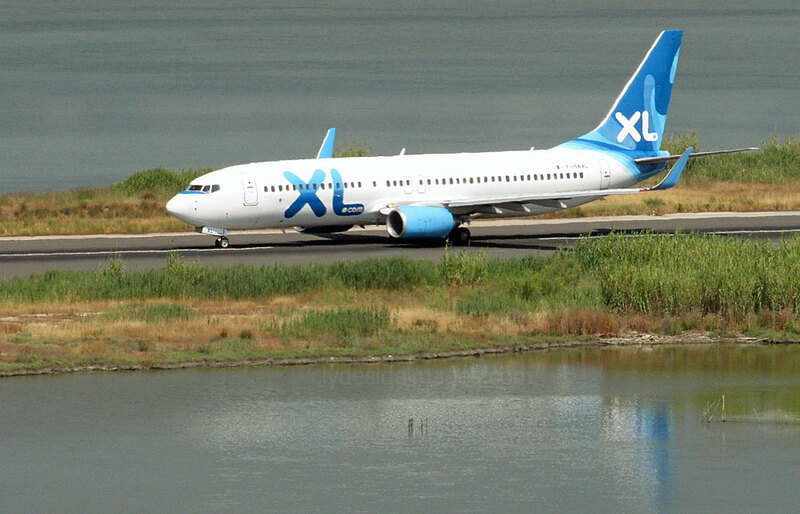 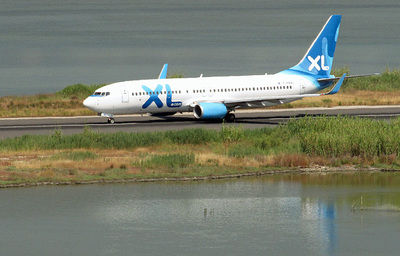 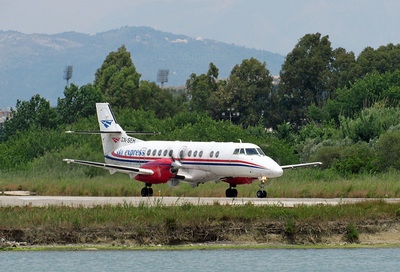 It operates charter flights mainly to the Mediterranean and the Canary Islands. During the 2016/2017 season Novair are supplementing their own aircraft with an Airbus A320-200 leased from Titan Airways. 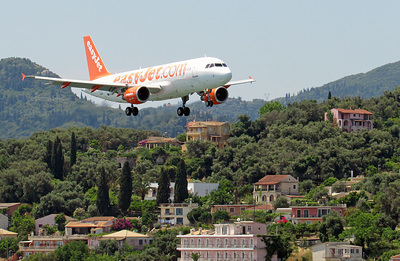 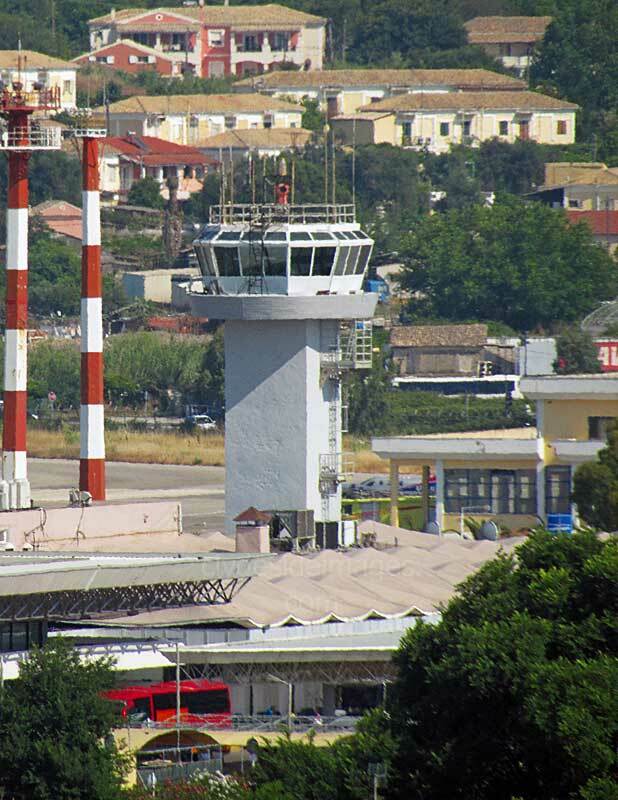 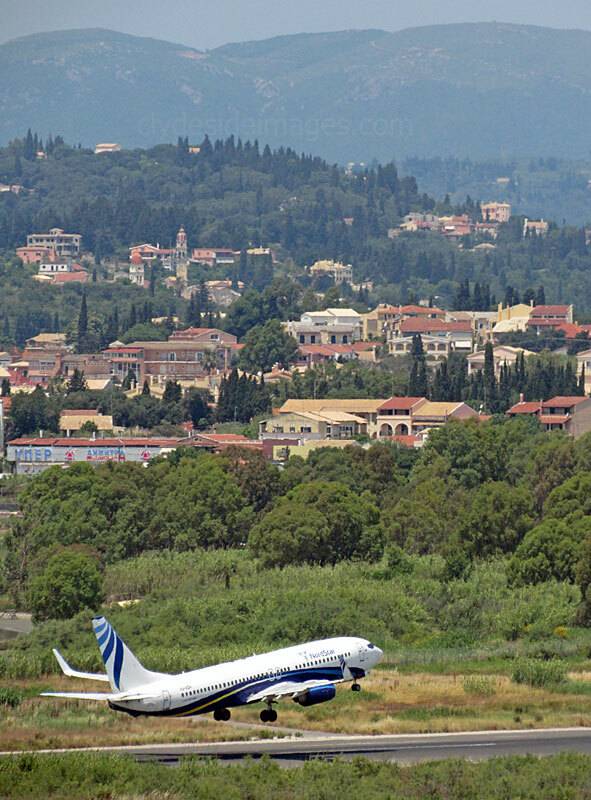 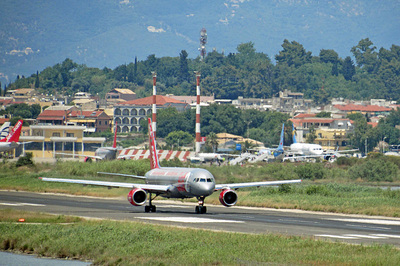 North of the airport, beyond the control tower, the superstructure of any visiting cruise ships can be seen rising above the buildings of Corfu Town. 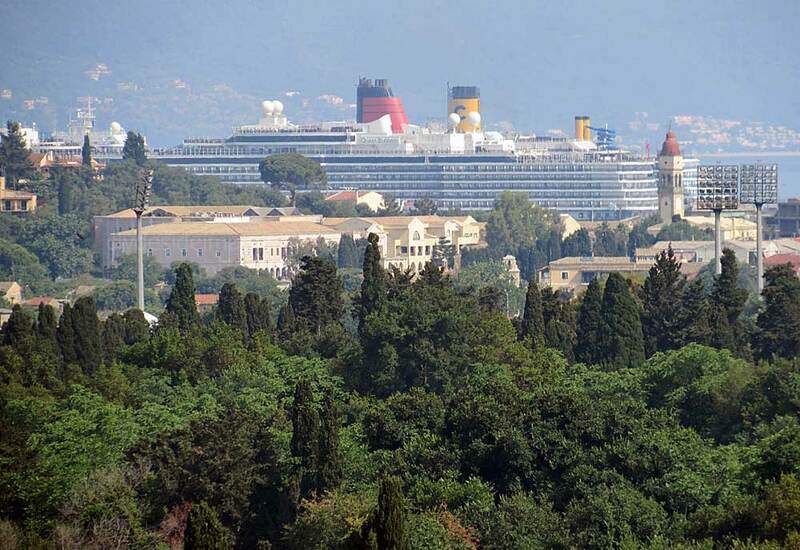 The red and black funnel belongs to Cunard's flagship Queen Elizabeth. 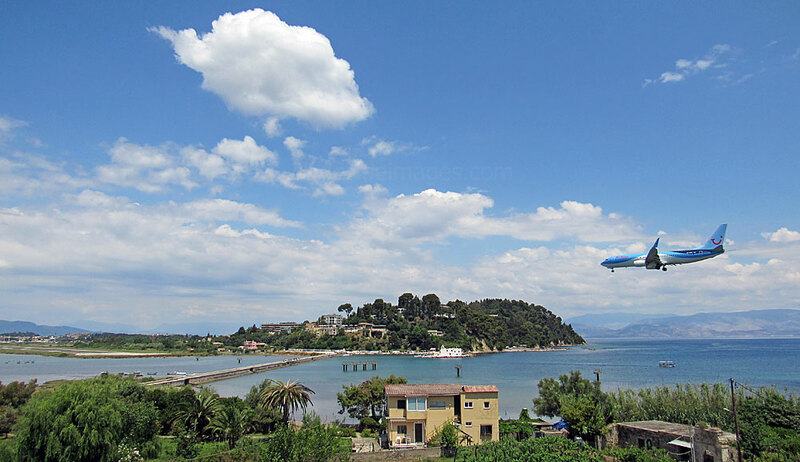 Queen Victoria also called in later in the week but, having seen both vessels on the Clyde before, I settled for this distant `balcony` view. 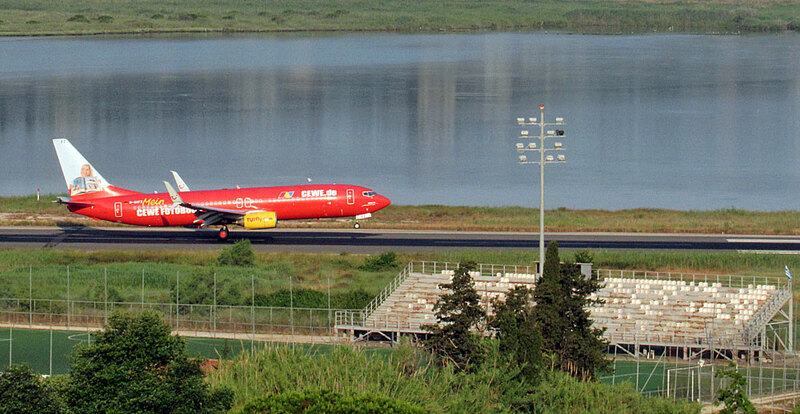 ​One evening, I noticed a match being played between what I took to be either local junior or amateur teams. 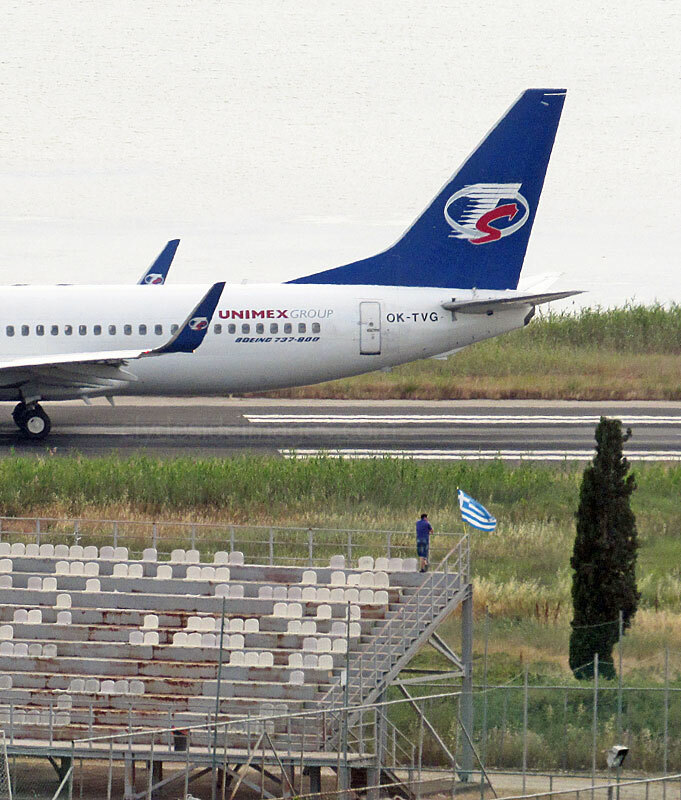 The stadium is only a 10 minute walk downhill from the Divani and there were quite a few spectators looking on. 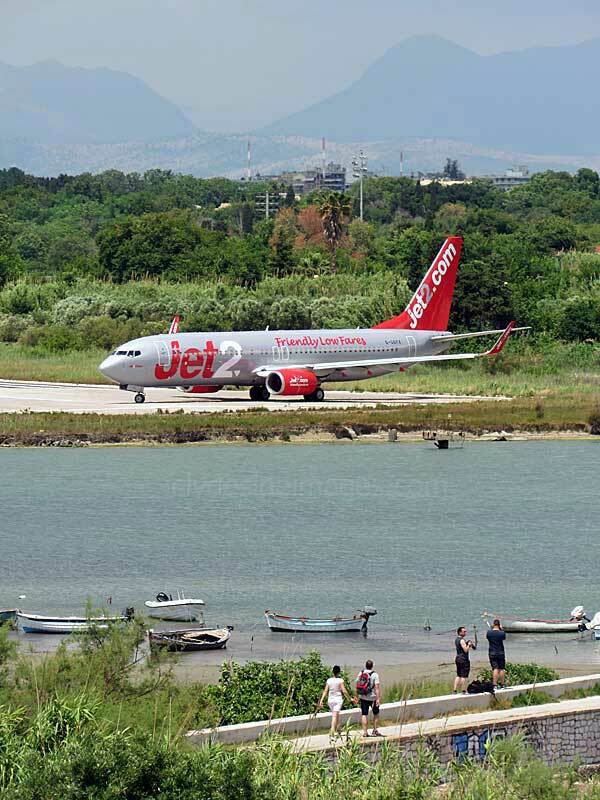 I`d be surprised if tourists weren`t welcome and the grandstand`s top row seats look as though they`d offer tremendous close-up views of traffic on the runway - one eye on the game and the other on the passing jets! 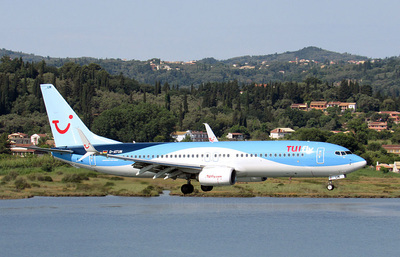 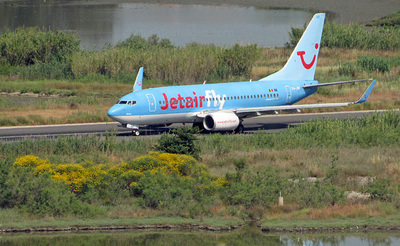 Pictured above is Boeing 737-8K5 D-AHFZ in TUIfly`s CEWE Football livery. 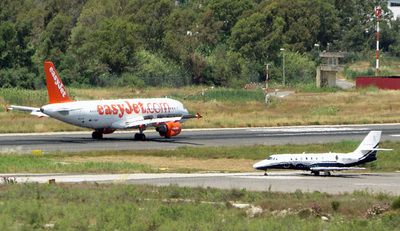 The guy on the right, who appeared the following day was obviously thinking along the same lines! Privilege Style Boeing 757-256 EC-HDS is pictured landing, below. 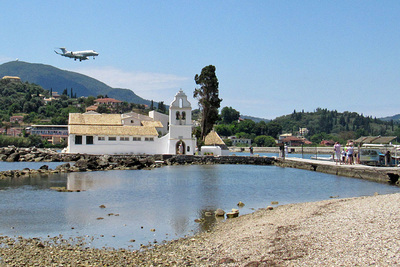 From the causeway, or the west side of the lagoon, the New Fortress also forms part of the skyline. 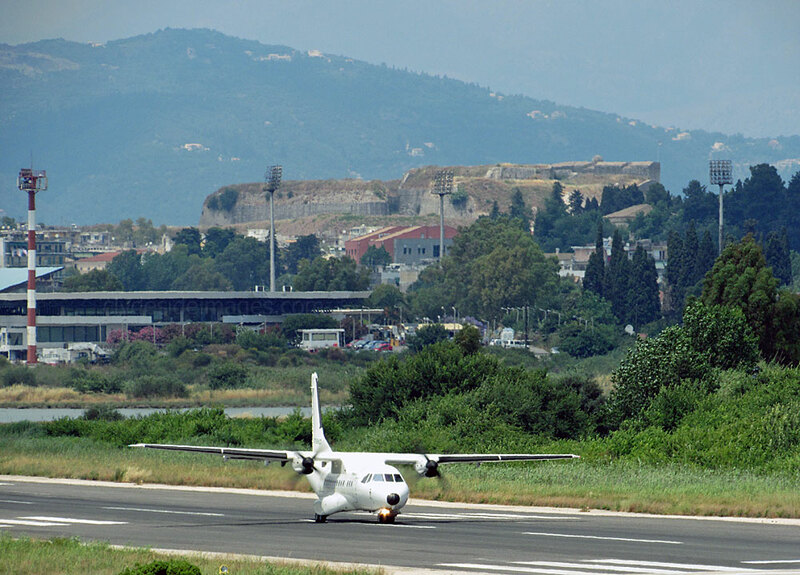 The New Fortress is smaller and not as high as the Town`s original fortress to the south and was built to protect the Old Harbour and its approaches. 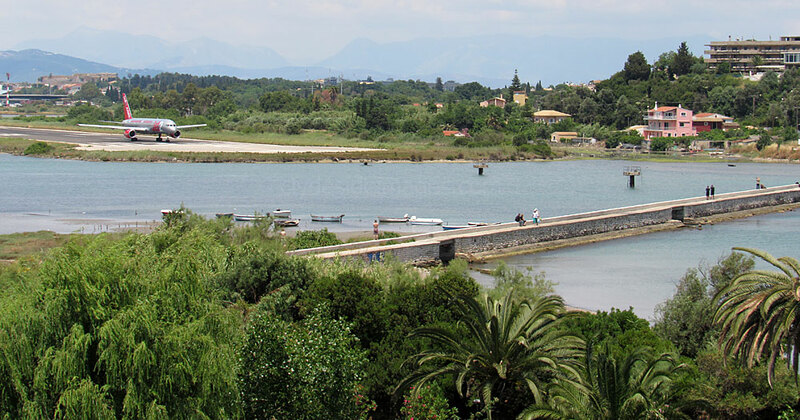 The Venetians began construction of the stronghold in 1577 and it was completed together with the town wall around 1588. 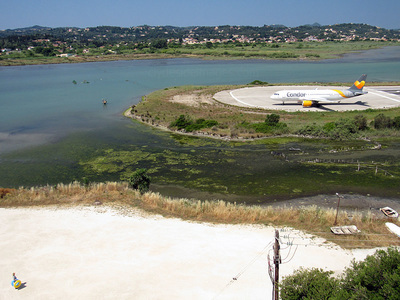 A broad, deep moat was also added to bolster defences. By early afternoon, the light is far better from vantage points on the west side of the lagoon where there's a tiny, rather unattractive patch of beach (above) next to the end of the causeway. 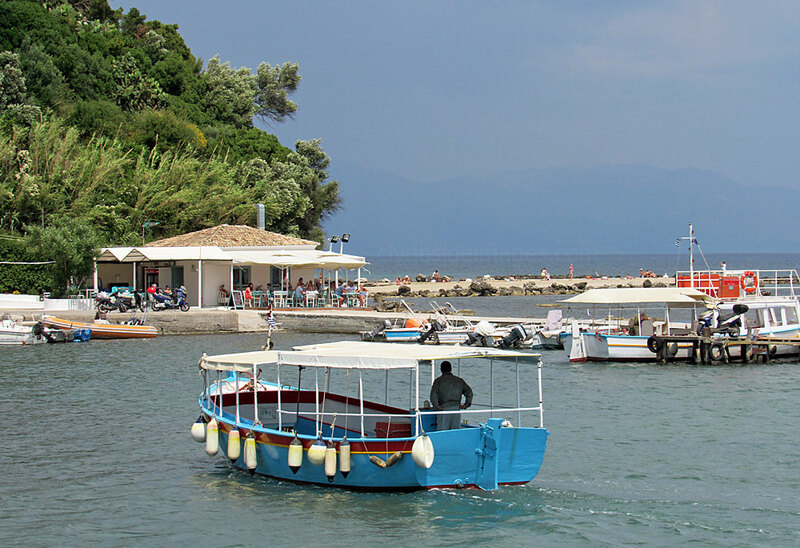 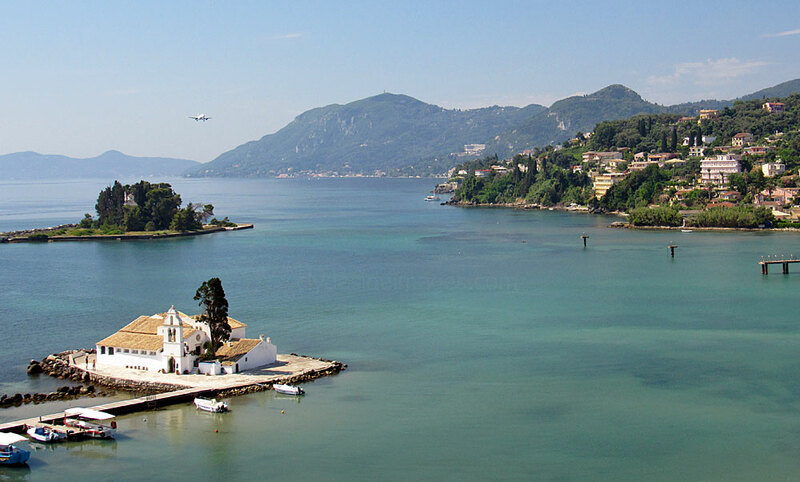 ​The tiny islands of Vlaherna and Pontikonisi, the latter better known as Mouse Island, feature in more postcards than any other location in Corfu. 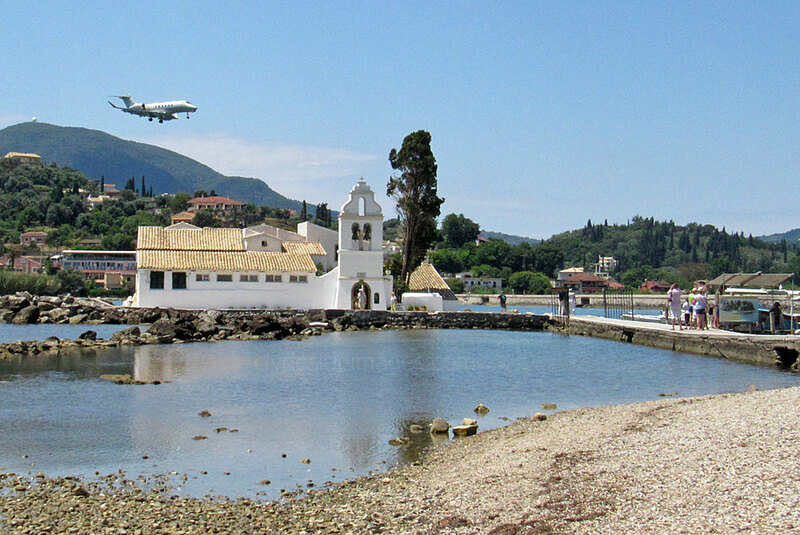 Vlaherna is the small flat island accessed via a short causeway and is completely occupied by its small whitewashed 12th century monastery. 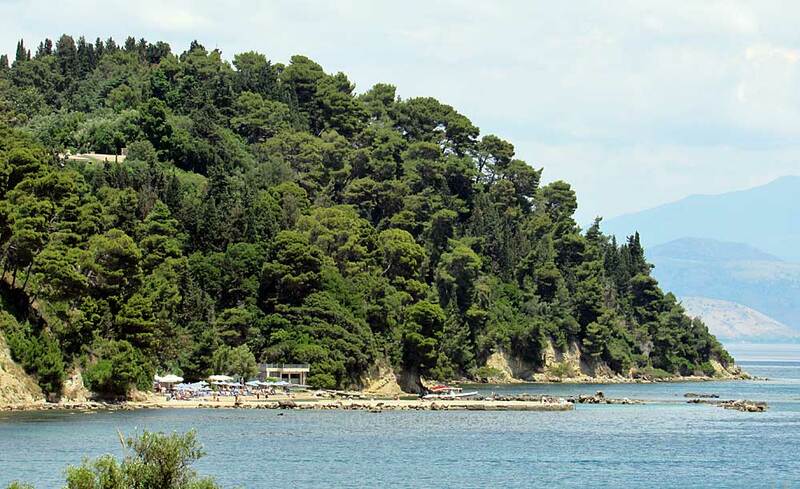 Slightly larger and heavily wooded, Mouse Island hosts a 13th century monastery which can be reached by one of the small ferries which run throughout the day. 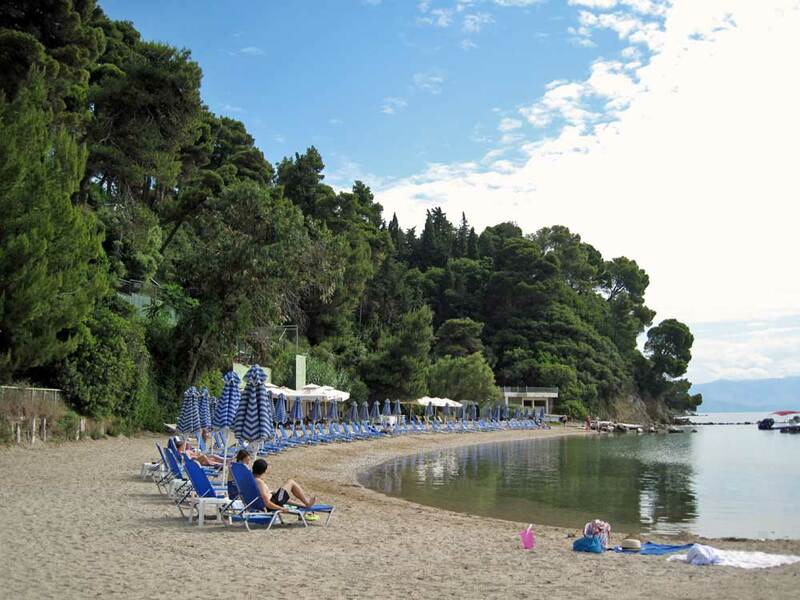 ​Back on the east side of the lagoon a larger and more appealing sandy beach can be found at the foot of the heavily-wooded slopes that mark the Kanoni peninsula's southernmost point. 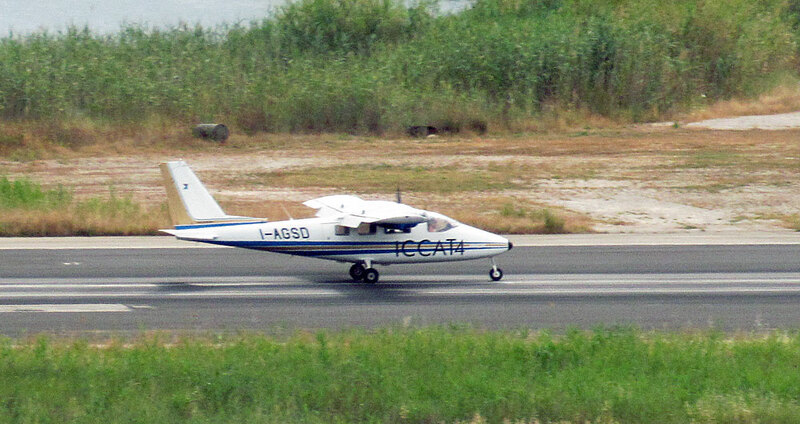 There`s also a small cafe which conveniently faces onto the normal approach path. 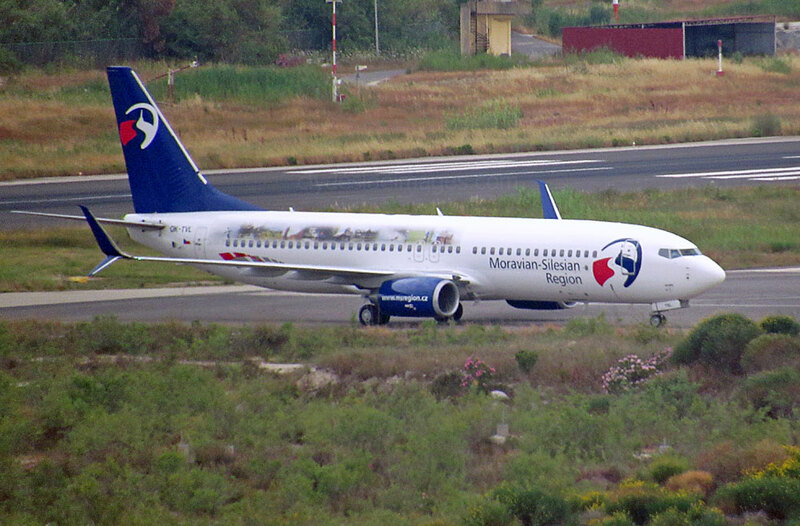 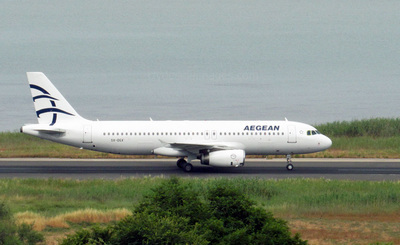 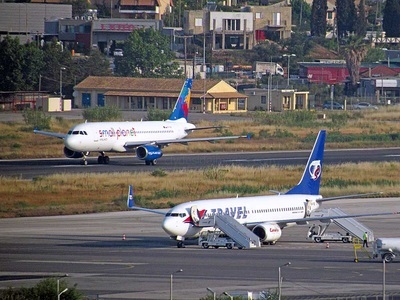 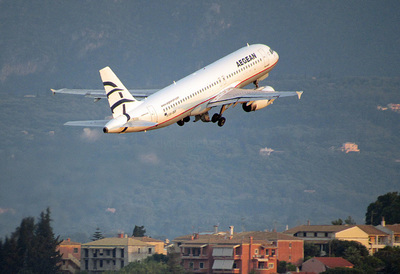 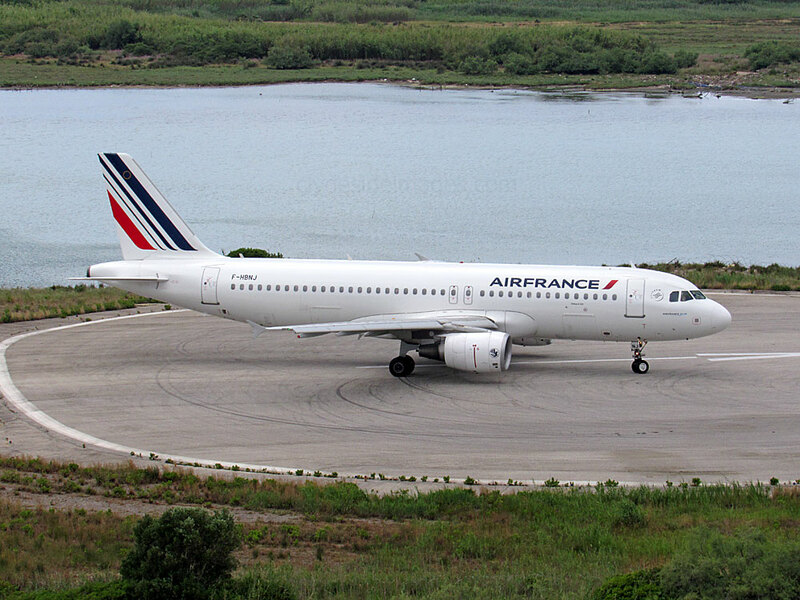 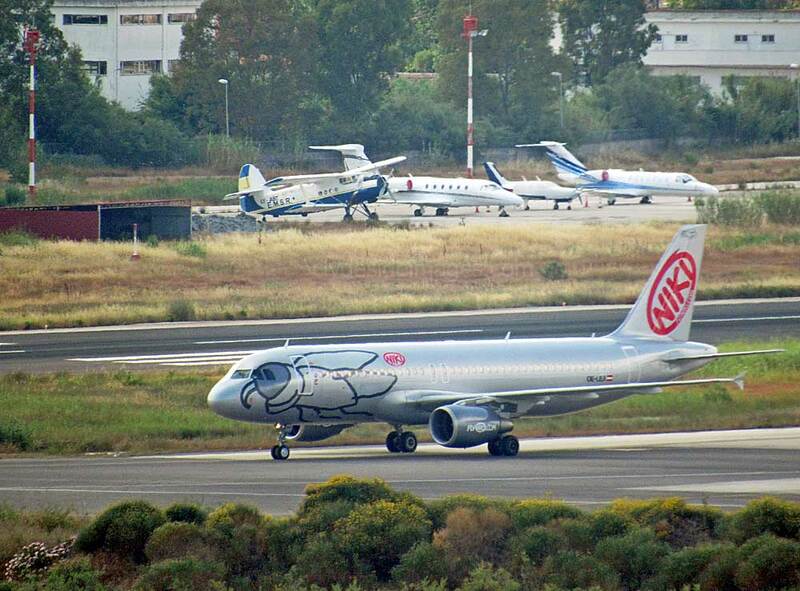 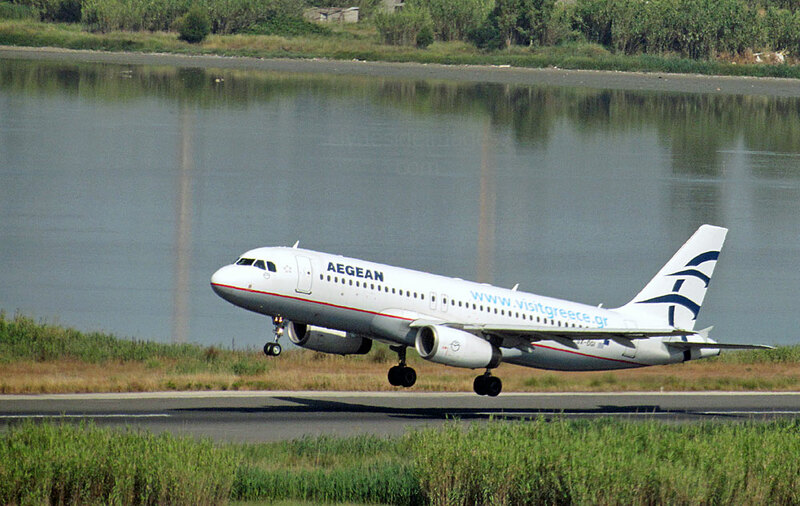 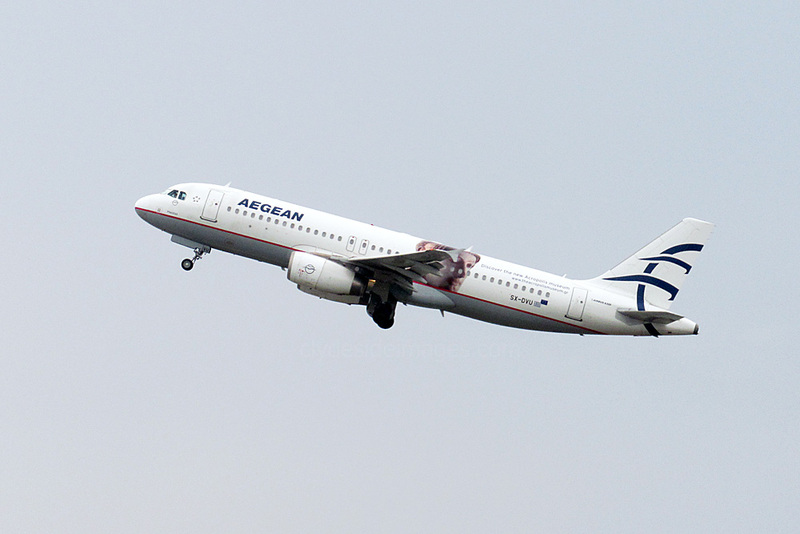 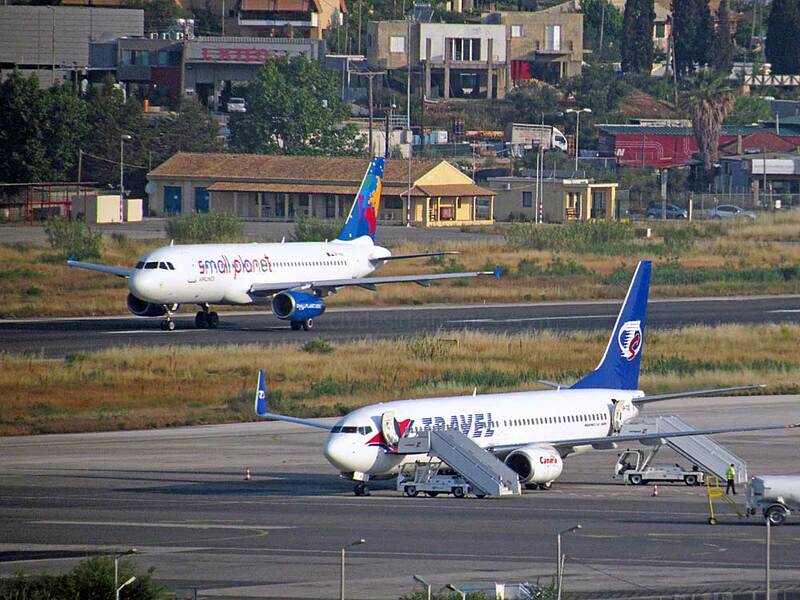 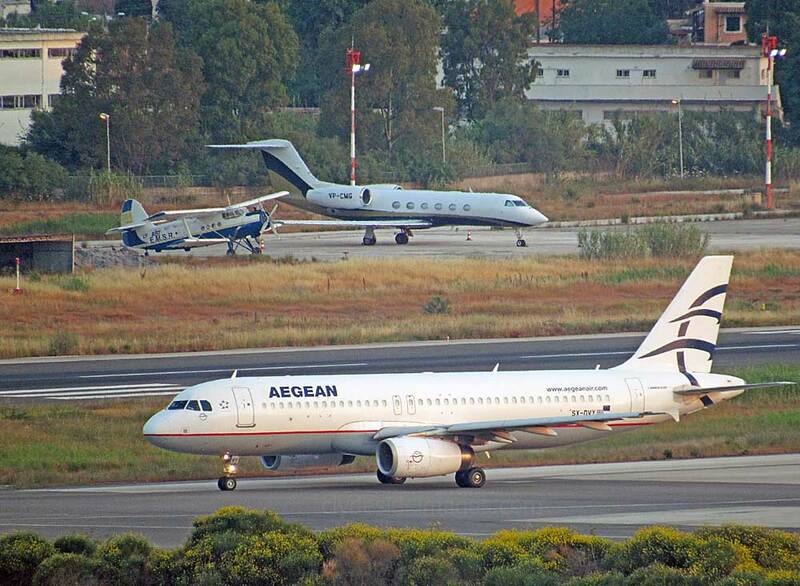 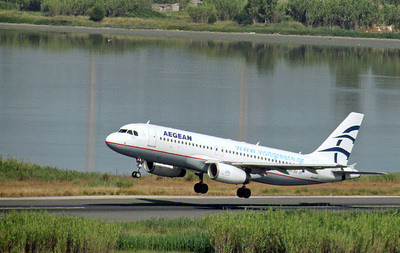 ​​Several Aegean A320s appeared each day. This is SX-DVY. 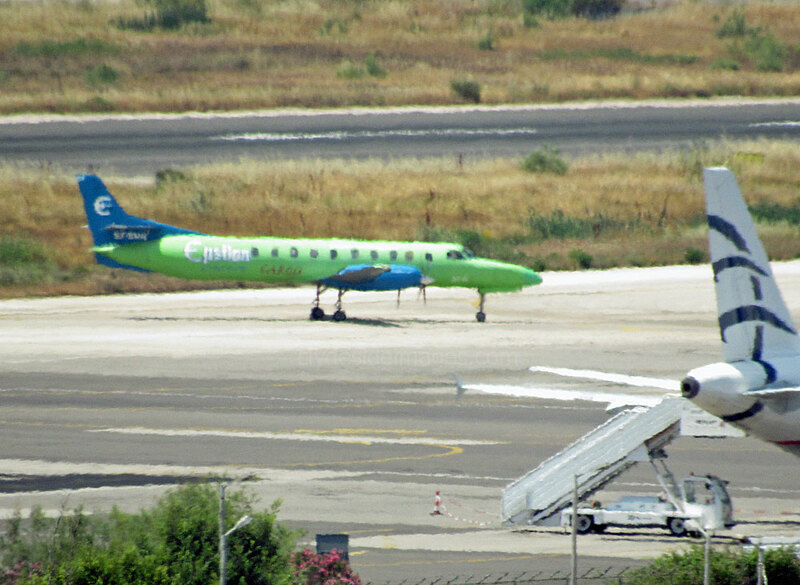 Cayman Islands registered Gulfstream 5 VP-CMG and Corfu`s resident Lithuanian-registered Antonov AN2-TP bi-plane LY-ABT are in the background. B​iz jets and props, from the US, Israel, and various European countries, some of which I assume were on delivery, made a welcome change to the scheduled flights. 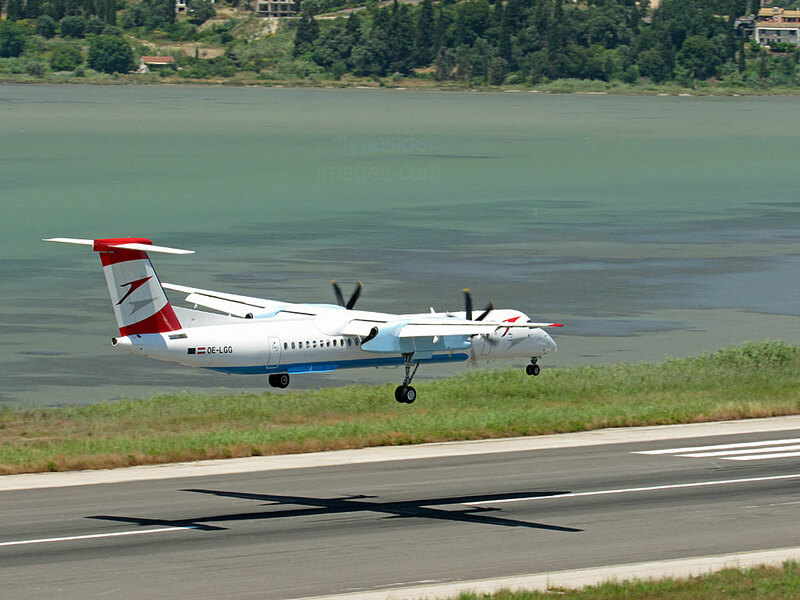 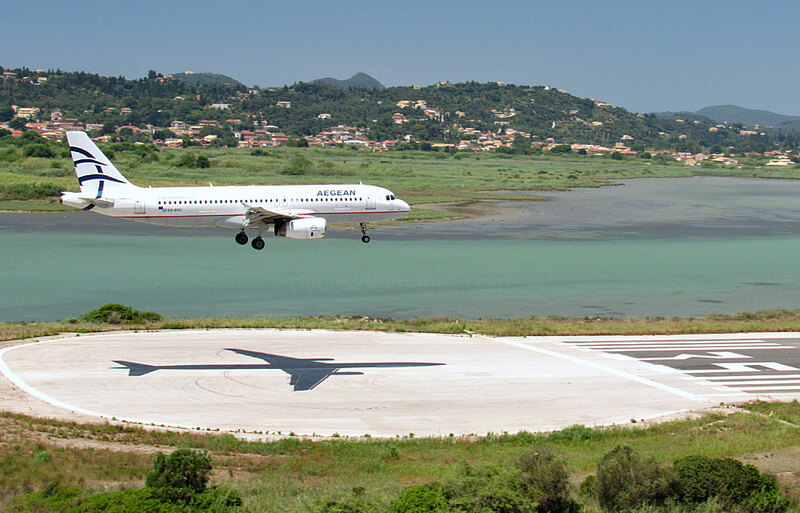 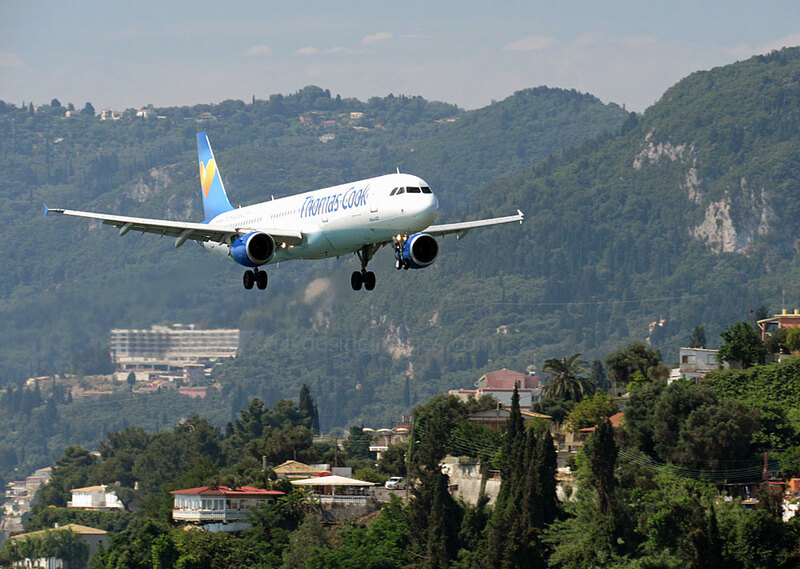 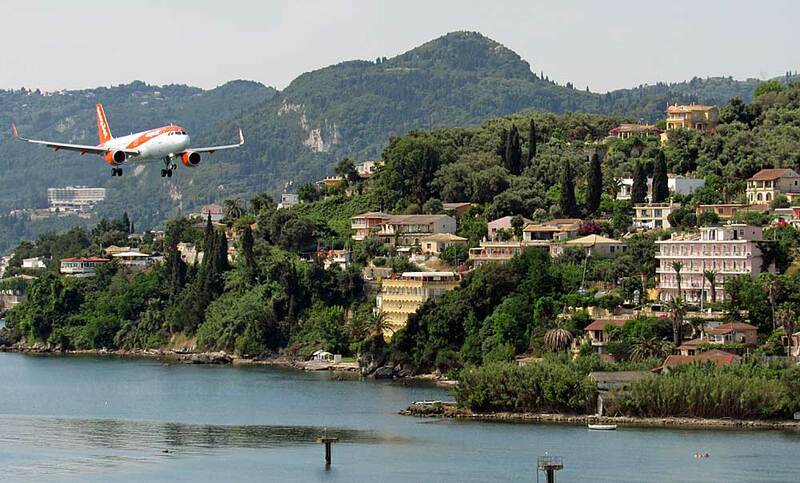 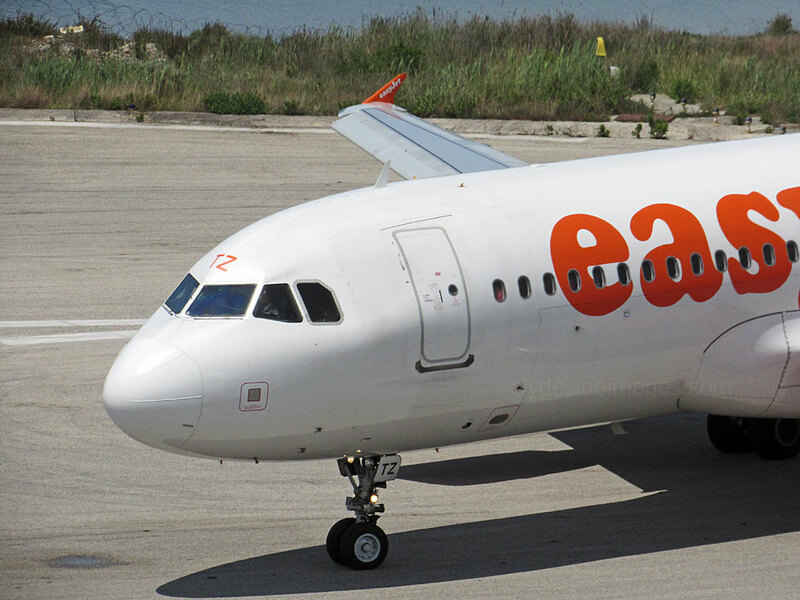 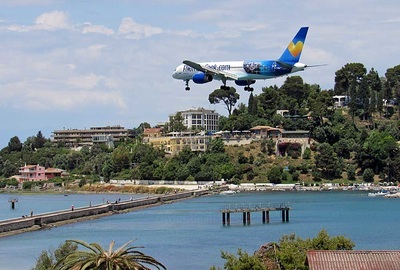 ​From an aviation enthusiast's point of view, May to September is the optimum time to visit Corfu when a wide range of European charter airlines, including those from Russia and its neighbours, transport tens of thousands of holidaymakers to and from the island. 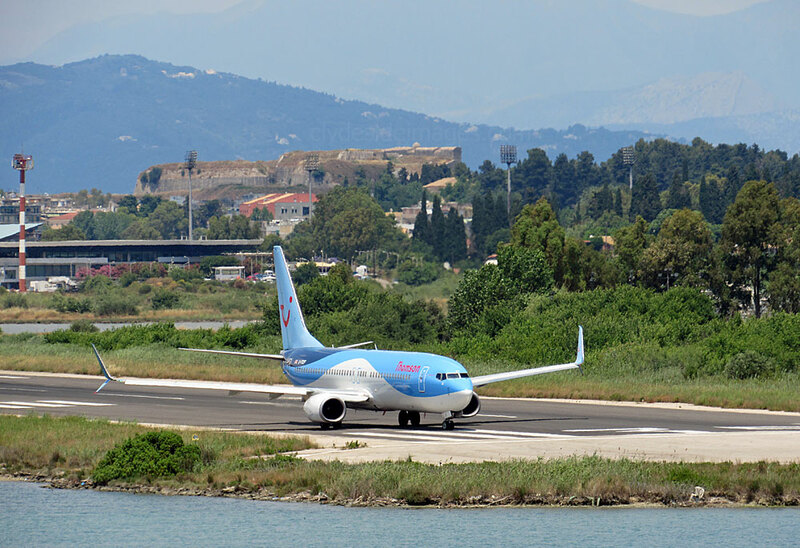 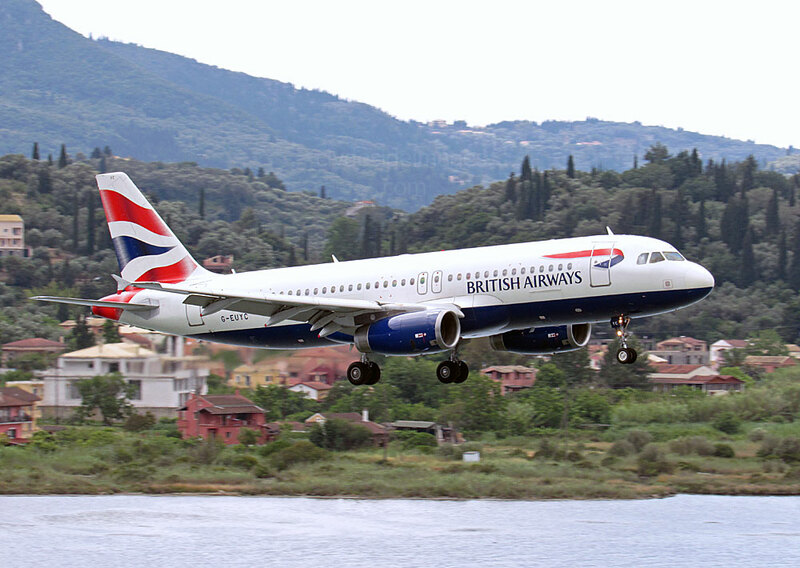 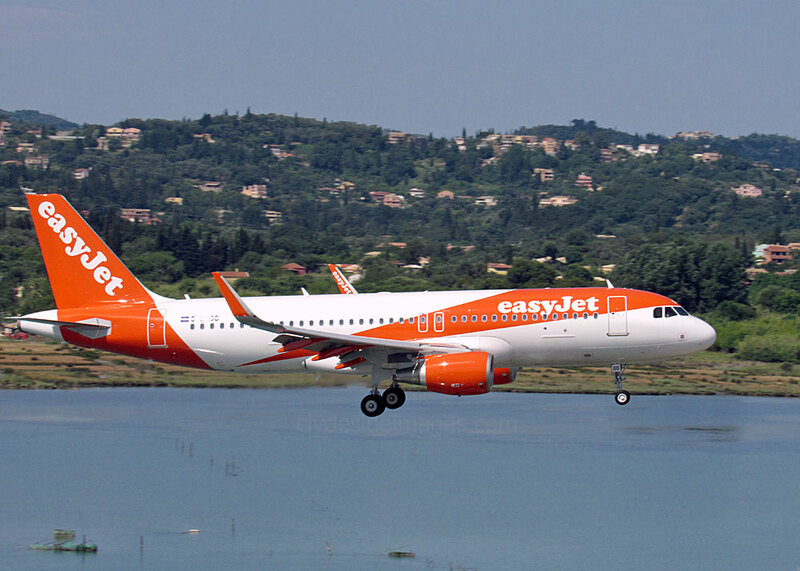 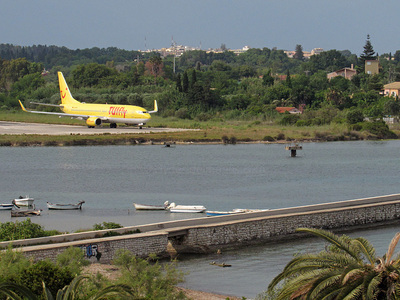 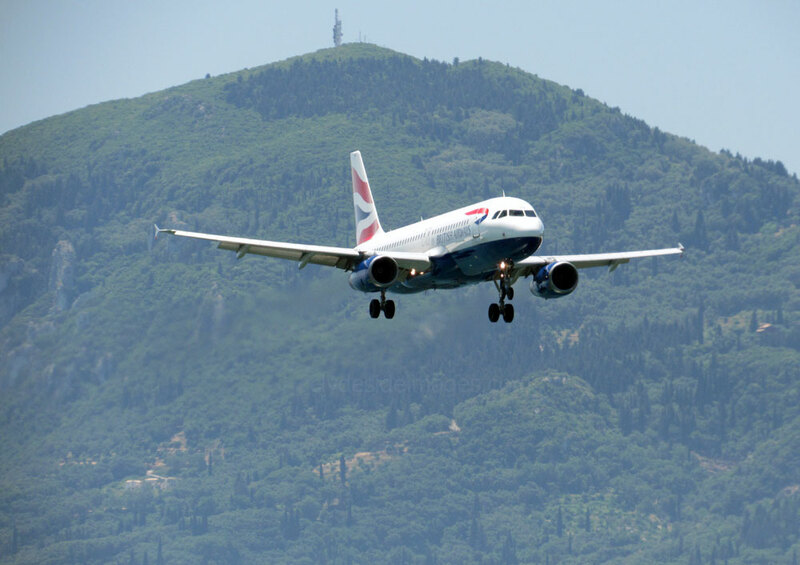 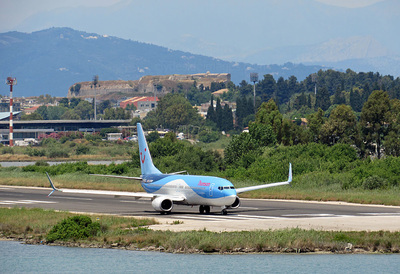 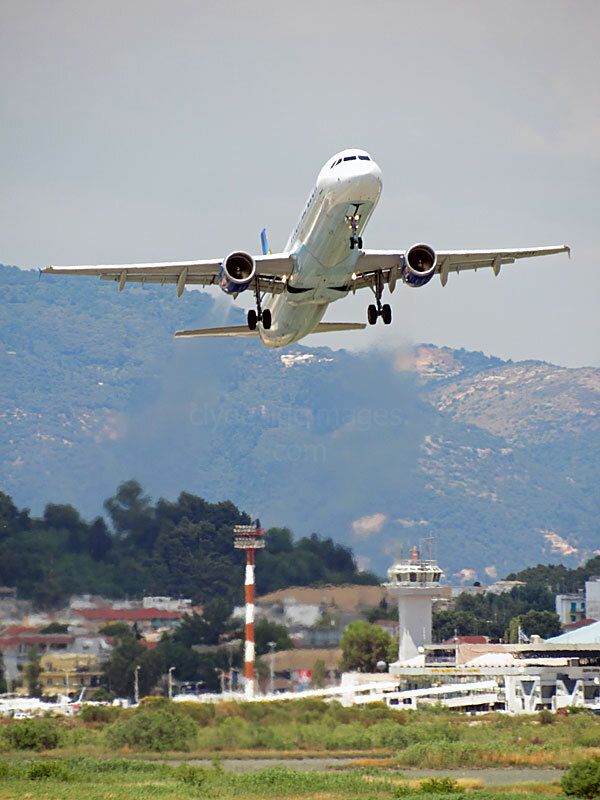 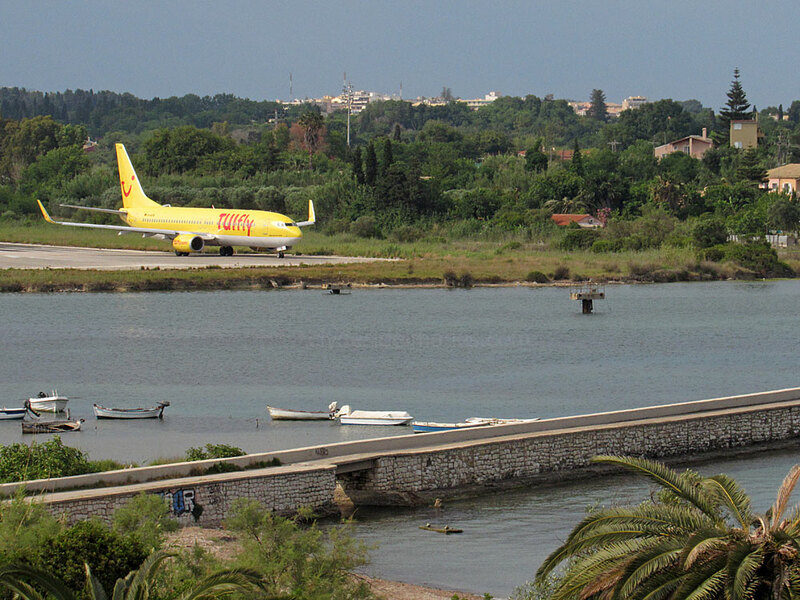 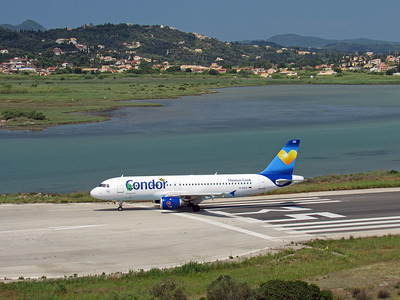 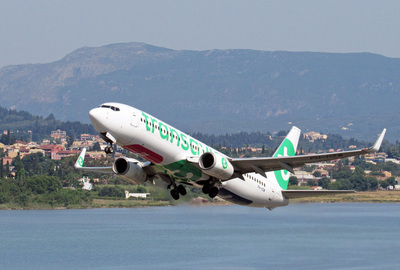 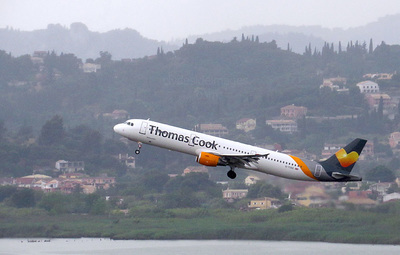 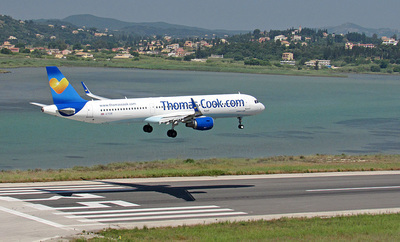 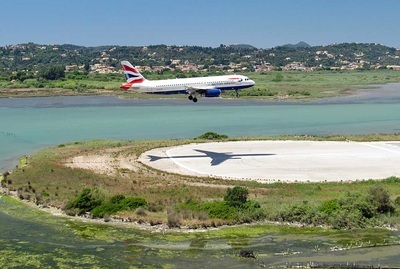 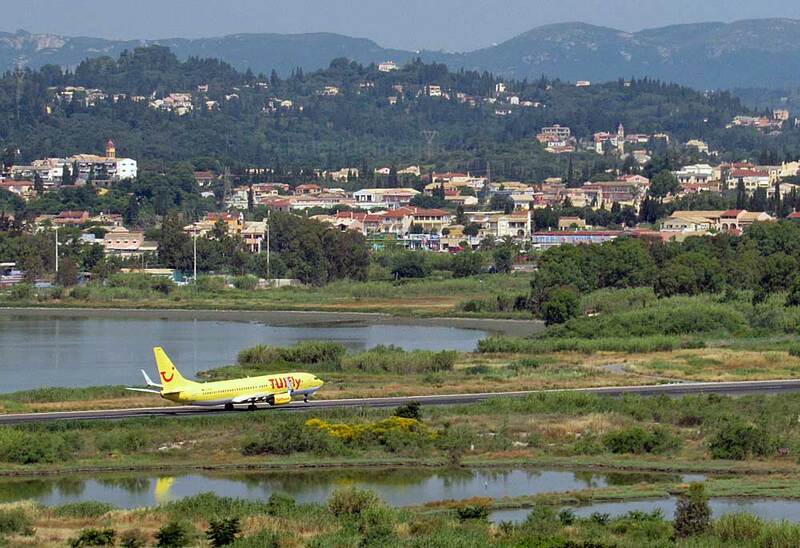 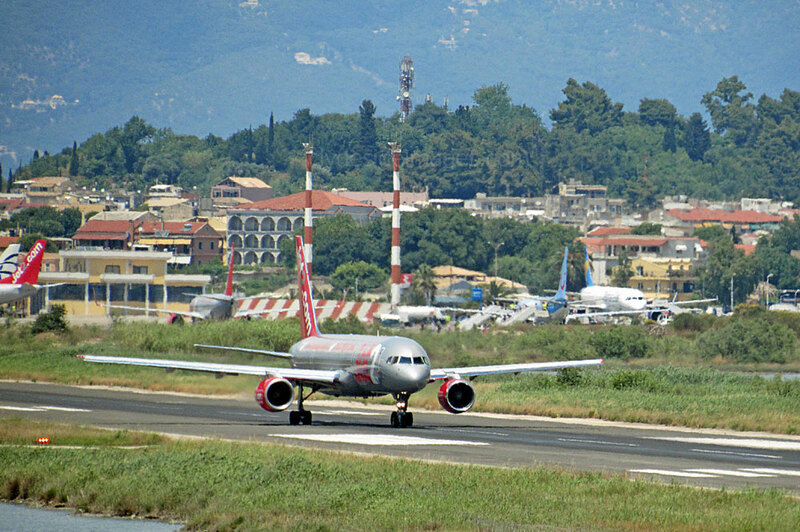 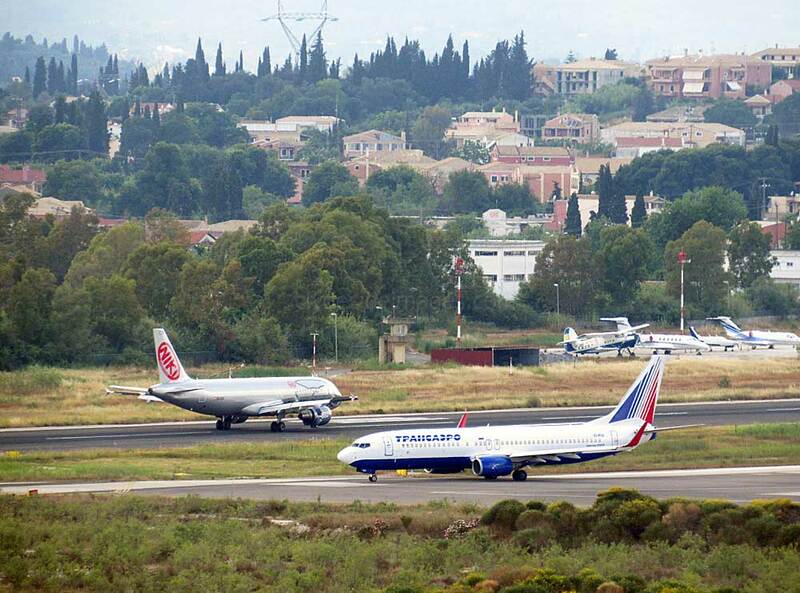 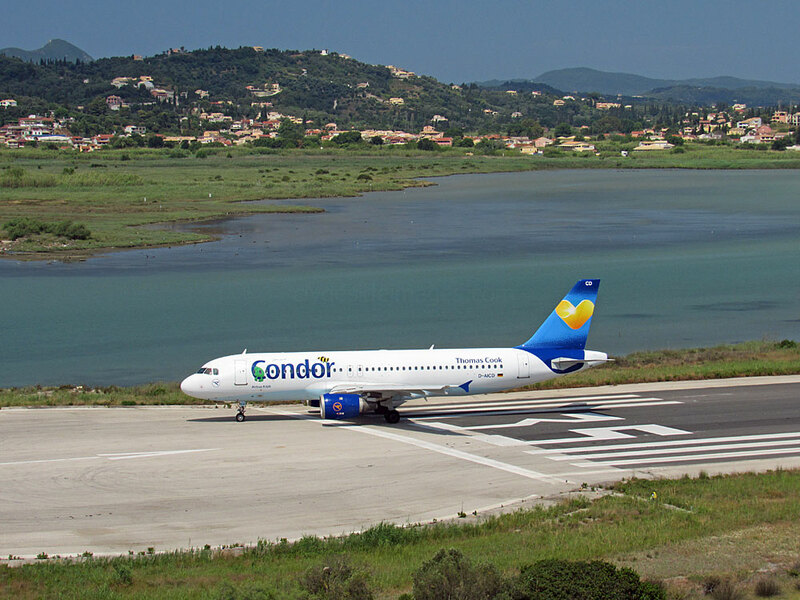 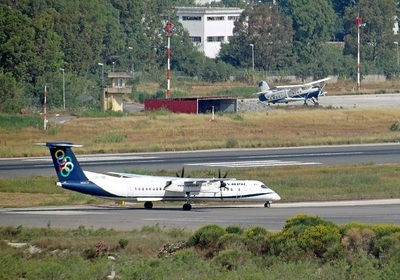 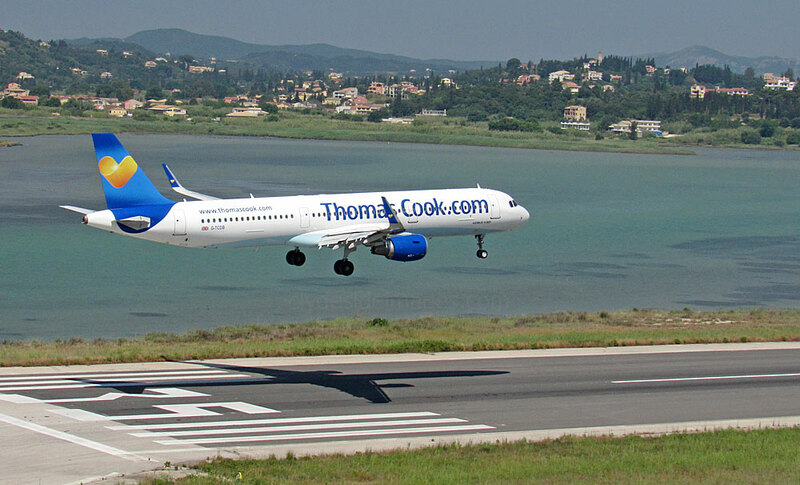 With regard to movements, Friday through to Monday is usually busiest at Corfu and I found that during the week, traffic would often tail-off around lunchtime, pick-up again in the afternoon and slow by early evening. 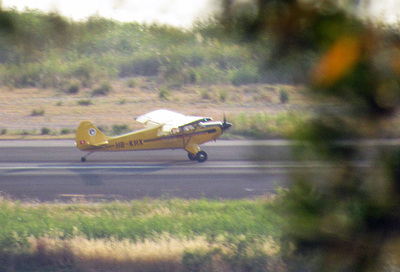 Wednesday was particularly quiet and there were long periods with no visible aircraft on-site at all, apart from a based Antonov biplane, but I'd be surprised if this level of activity was the norm at the height of the summer season. 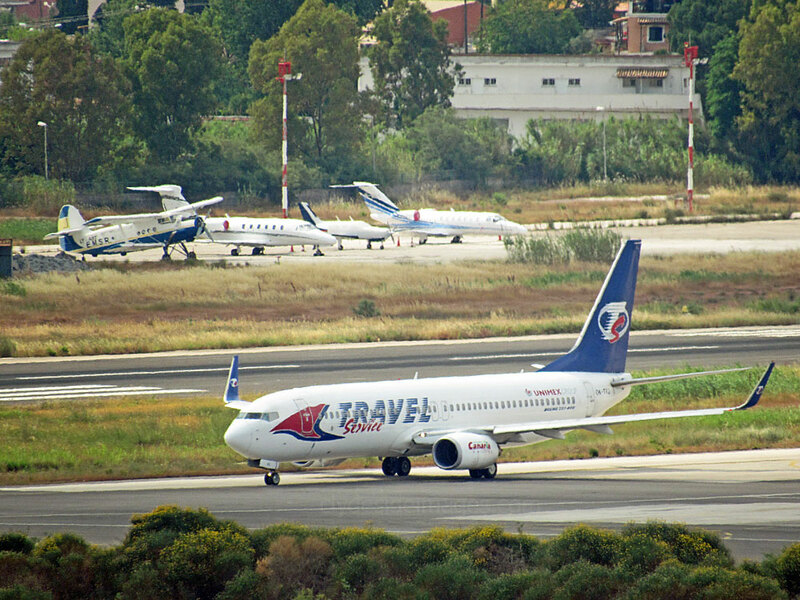 During my short stay the only Russian-built airliner to appear was a Transaero Tupolev Tu-124, the rest of these ex-Eastern Block flights being served by Western types such as Airbuses and 737s. 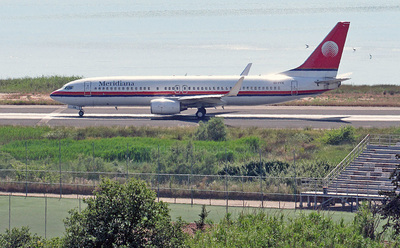 Tu-124 RA64549, above, flew in on 7 June. 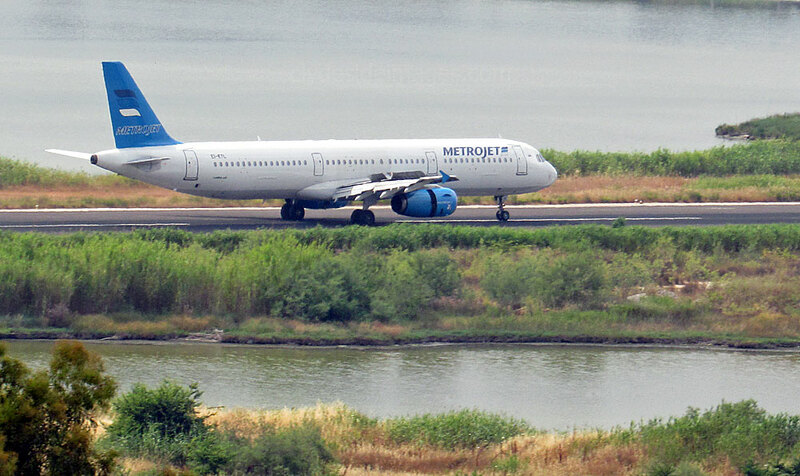 Russian outfit Metrojet operate a fleet of five Irish-registered A321-200s including EI-ETL, pictured above on June 6 taxiing in to its allocated stand. 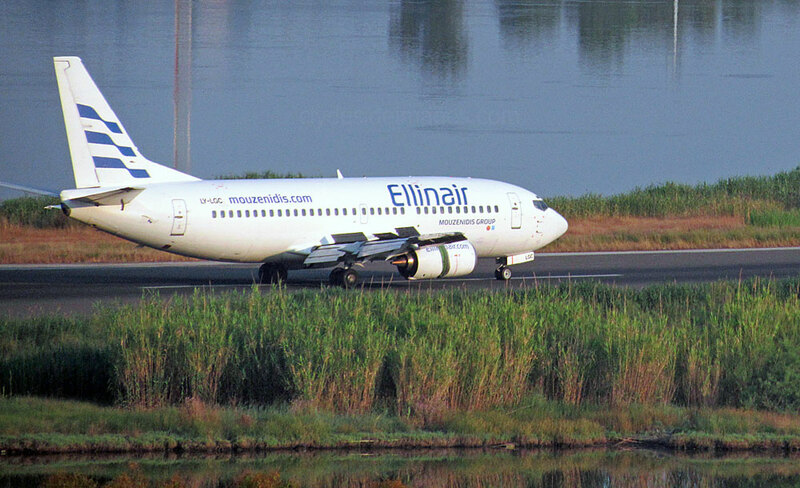 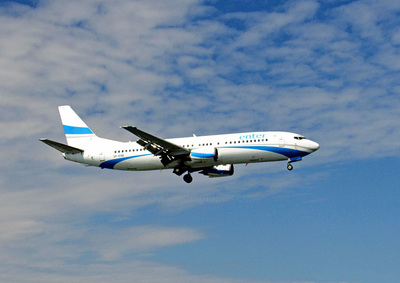 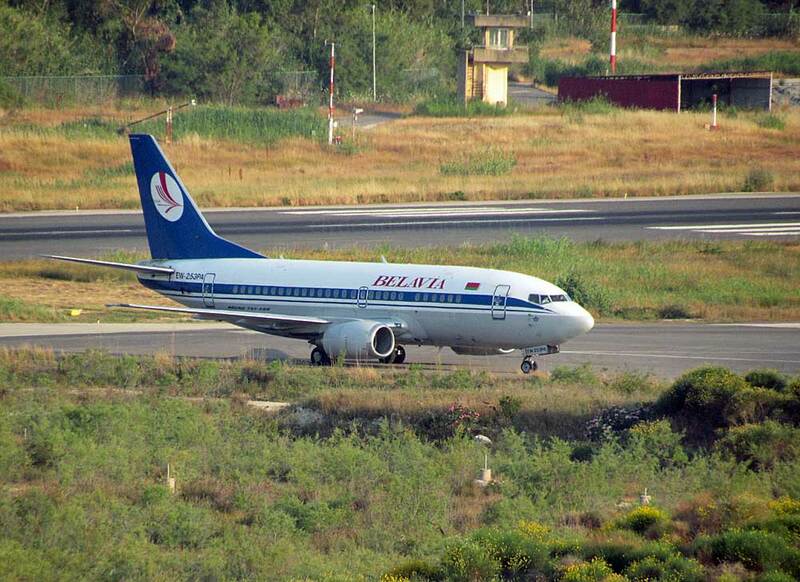 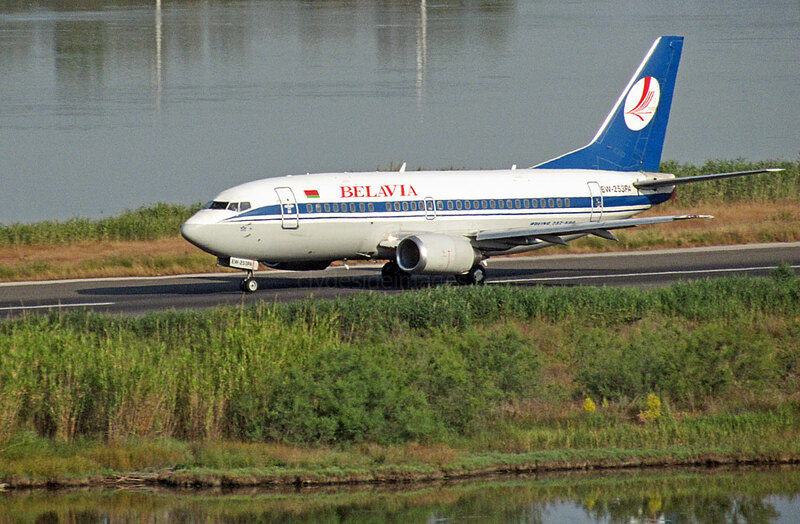 Boeing 737-524 EW-253PA of Belavia was operating between Corfu and Minsk on Tuesday 2 June. 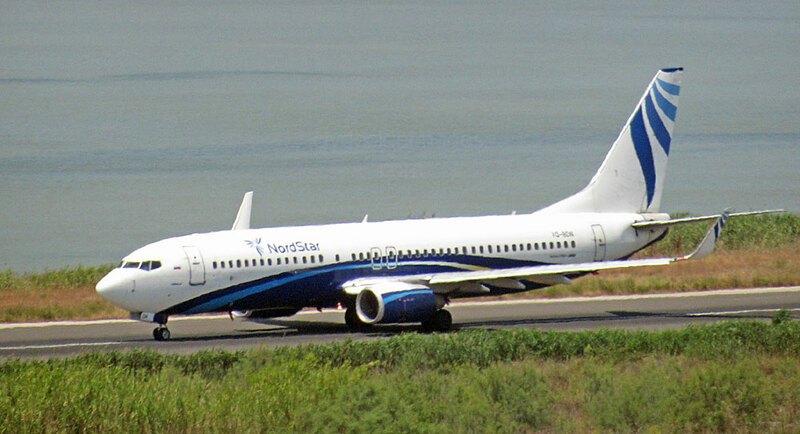 Above: More from Russia: Nordstar Airlines` Boeing 737- 8AS(WL) VQ-BCN with A319-111 VQ-BTL of VIM Airlines, top right. Above: Boeing 737-85P EI-RUI of Transaero Airlines. Officially OJSC Transaero Airlines, this company originally operated charters with aircraft leased from Aeroflot beginning in late 1991. 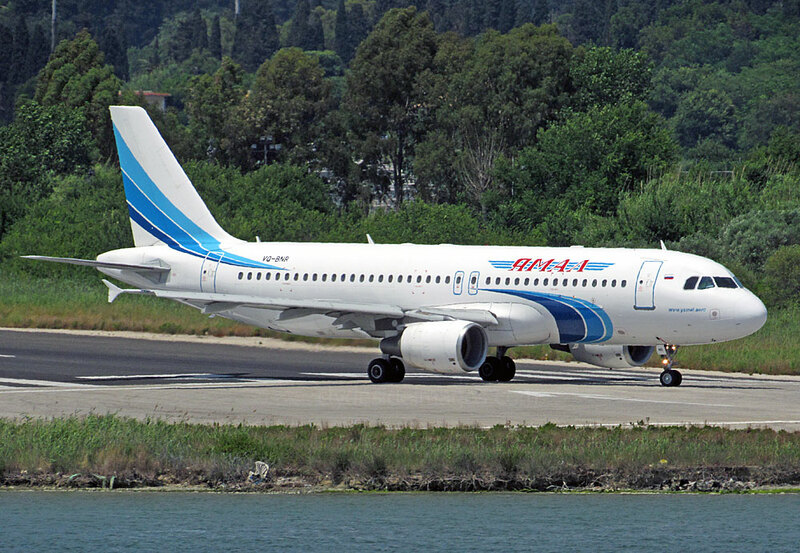 It went on to become the first privately owned airline to operate scheduled flights in Russia and beyond with its first international scheduled route flying from Moscow to Tel Aviv in November 1993. 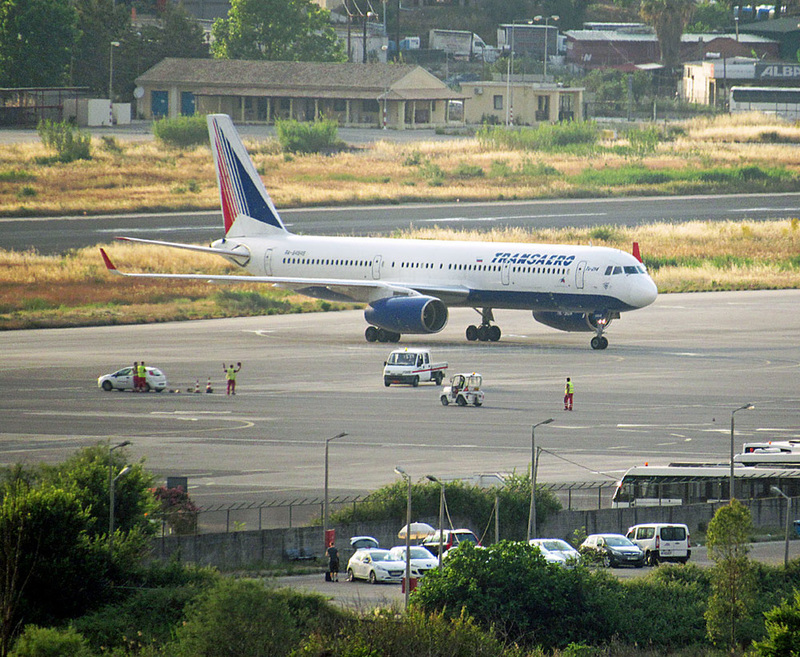 By this time Transaero had started operating Western-made aircraft, initially with Boeing 737s. Later the fleet included 757s, 767s, four 777s and a leased Virgin Atlantic Boeing 747-200. 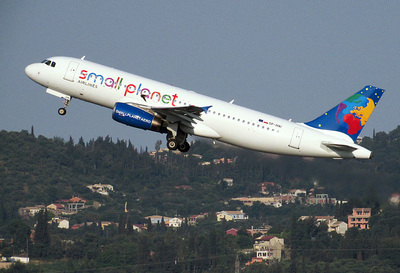 By March 2015, however, the Saint Petersburg-based airline had accumulated around 1.1 billion euros of debt and filed for bankruptcy. 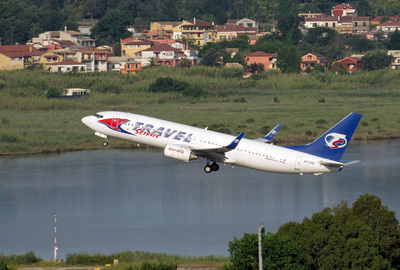 Russian authorities revoked Transaero`s operating licence on 26 October 2015. 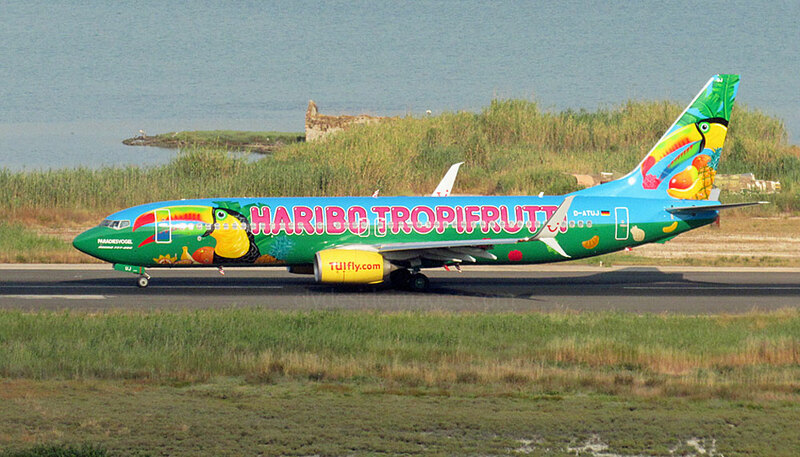 ​Saturday 6 June saw a fair amount of activity, mainly with German flights, including this TUIfly Boeing 737-8K5, D-ATUJ which is decked-out in a Haribo Tropifrutti livery complete with sweet-munching Toucans. 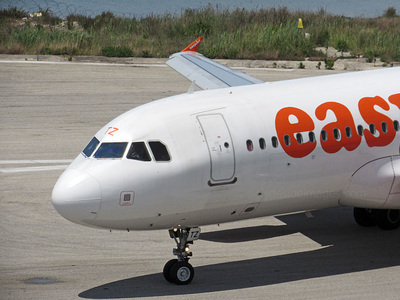 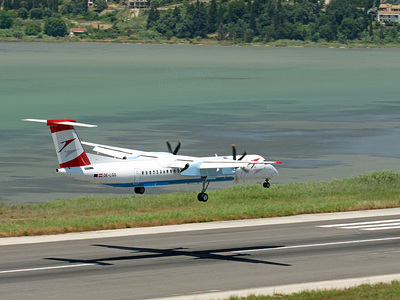 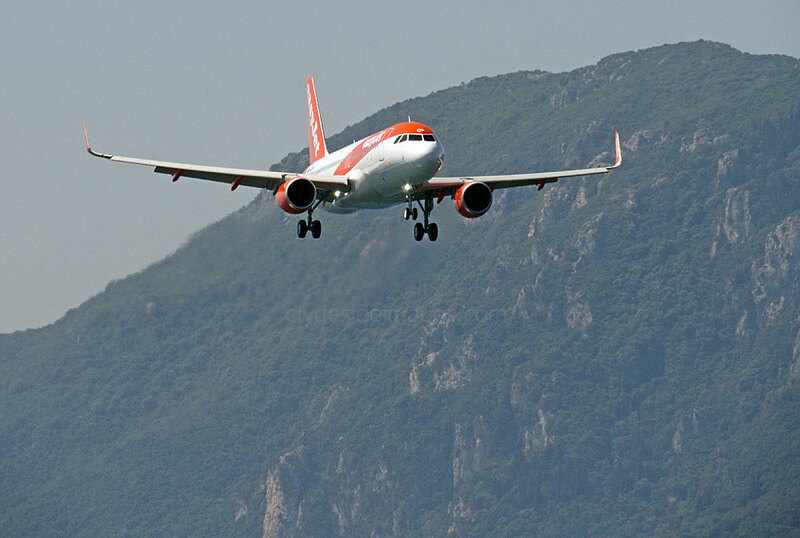 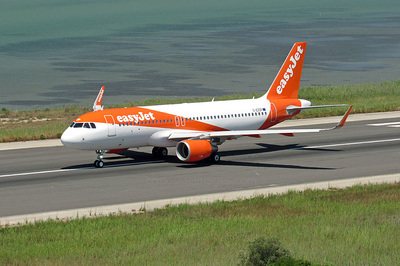 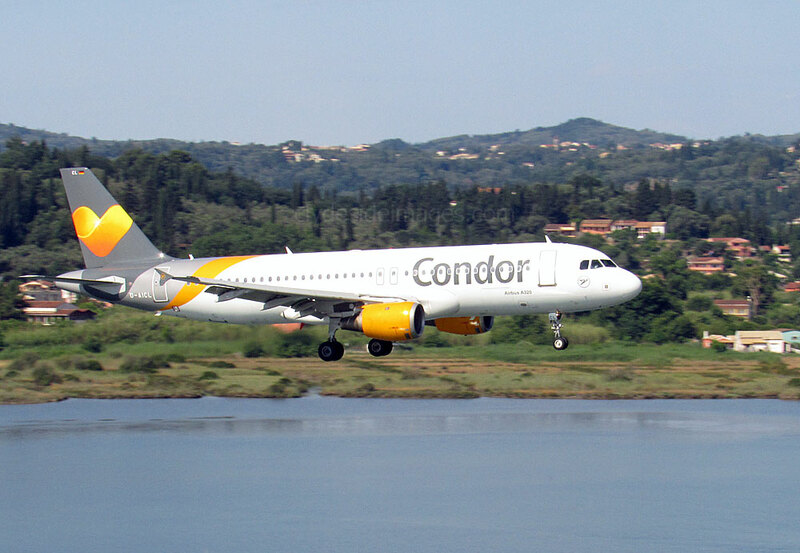 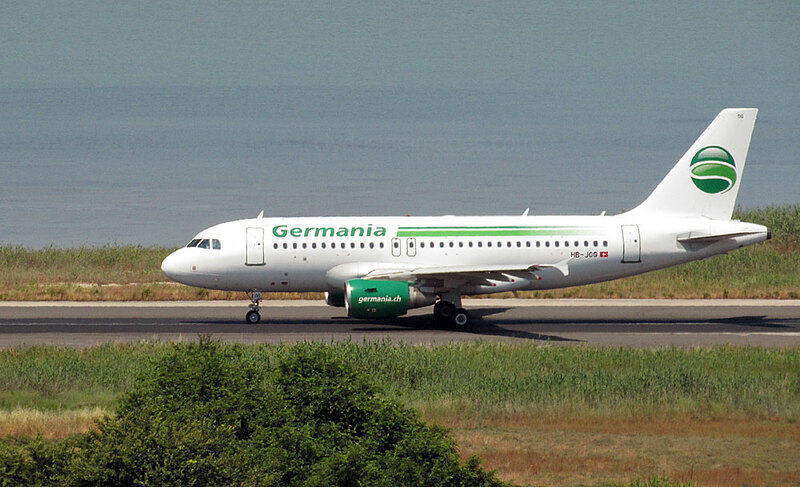 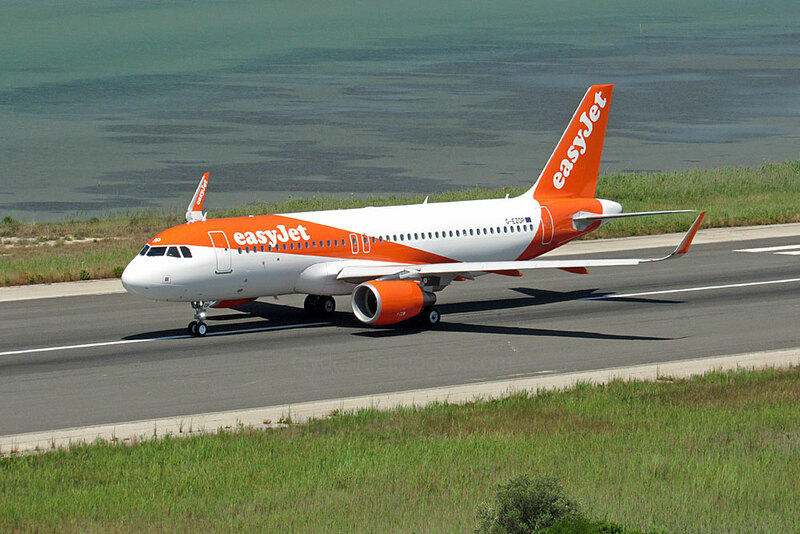 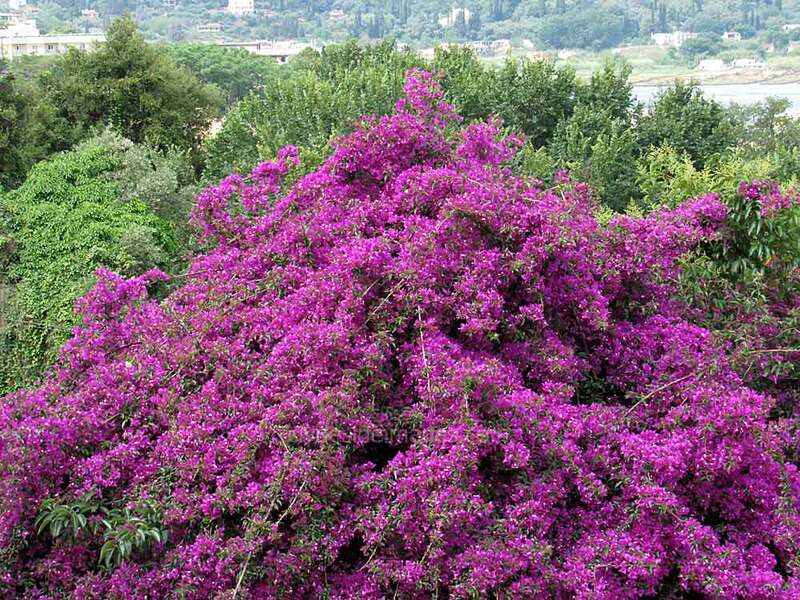 The aircraft was flying between Corfu and Hannover and reappeared in the afternoon. Travel Service Boeing 737-8Q8 OK-TVG. 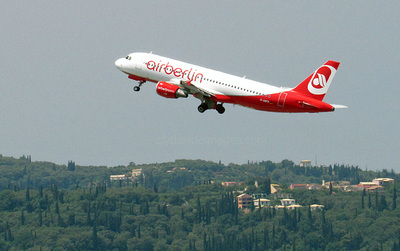 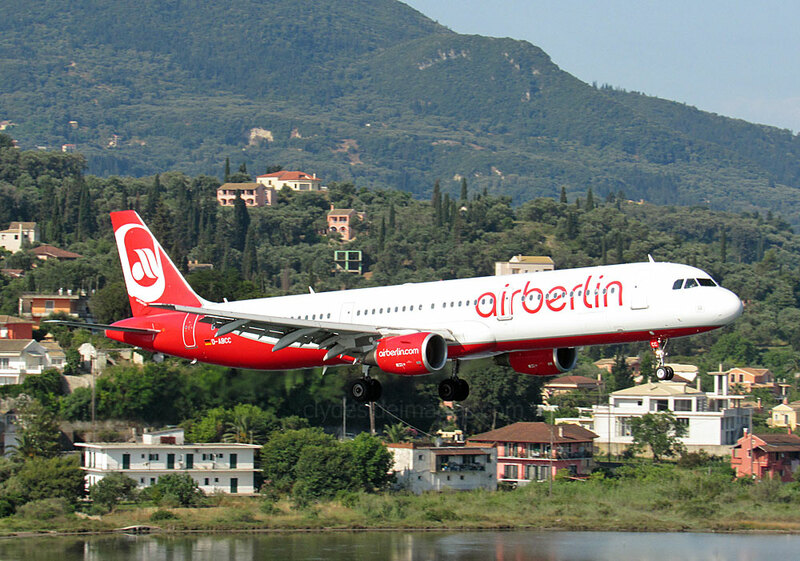 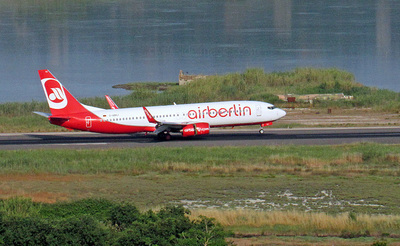 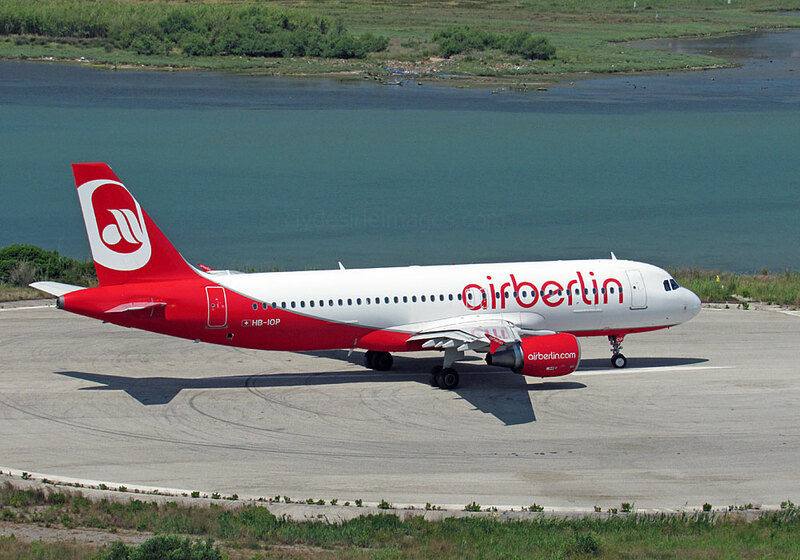 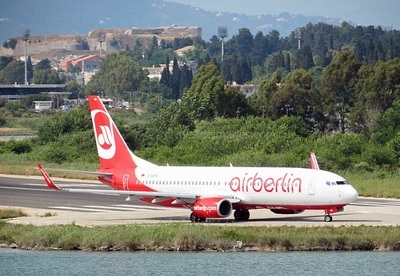 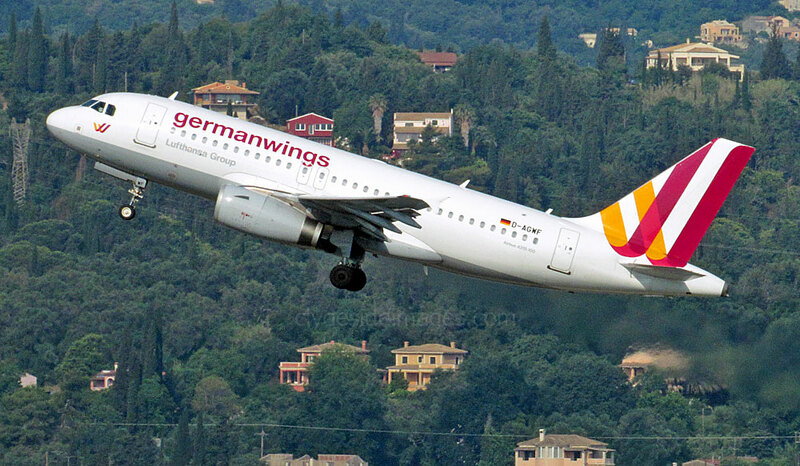 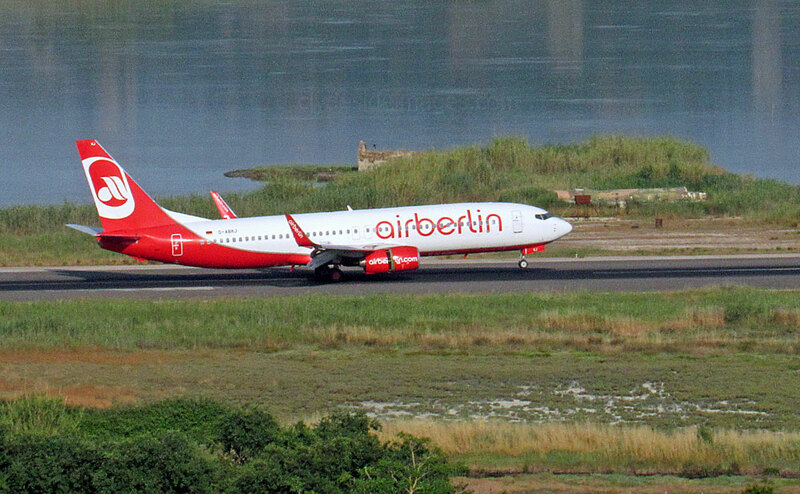 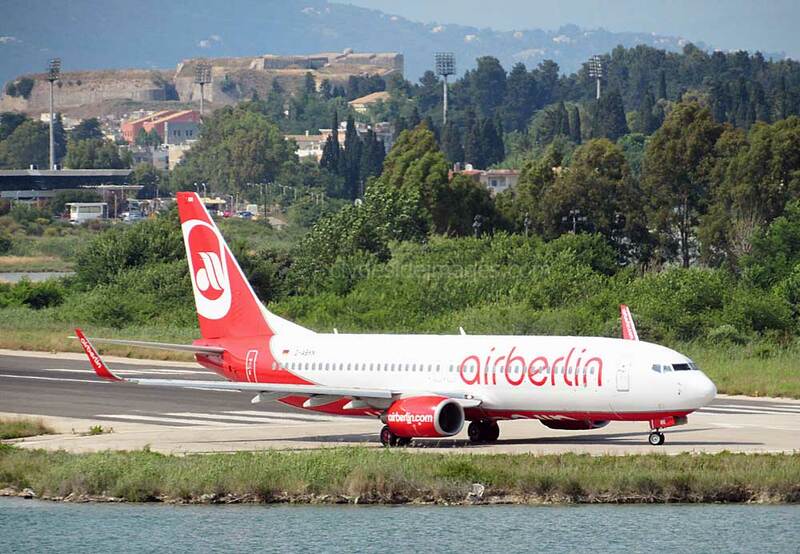 Airliners from the German charter companies such as Air Berlin, Germania, Condor and Germanwings were the most frequent visitors. 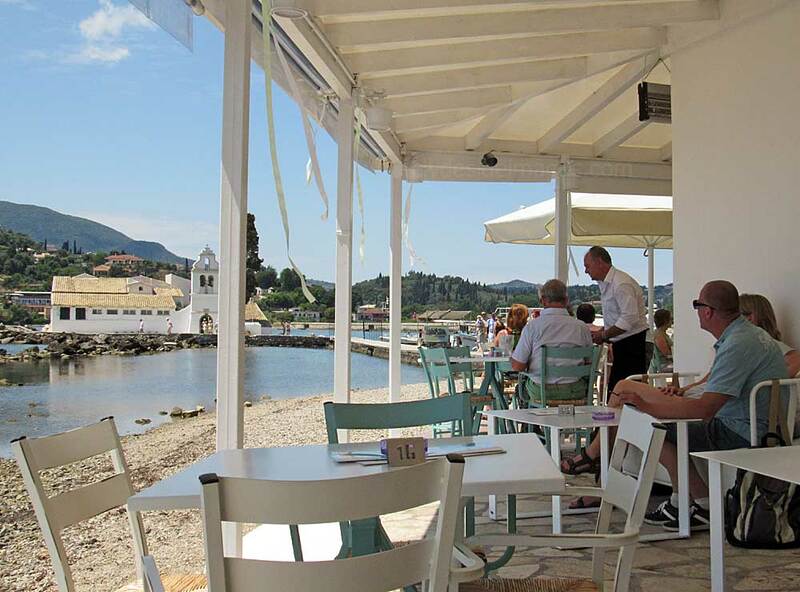 The above views were taken from Nsos taverna. ex-Belair Airbus A320-214 HB-IOP Air Berlin. 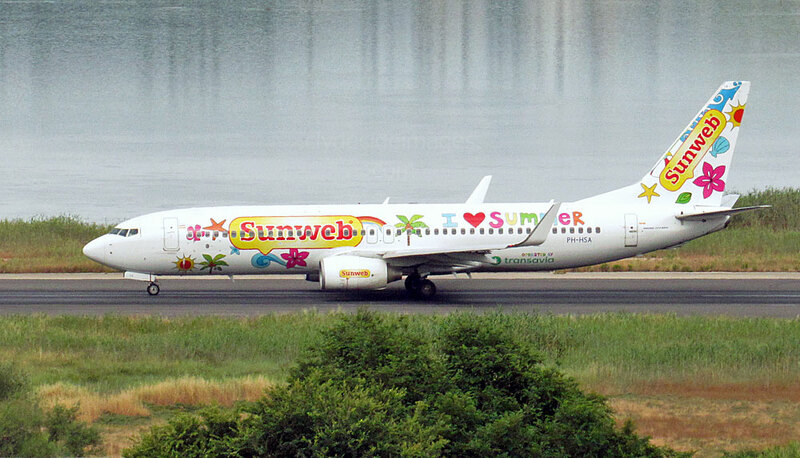 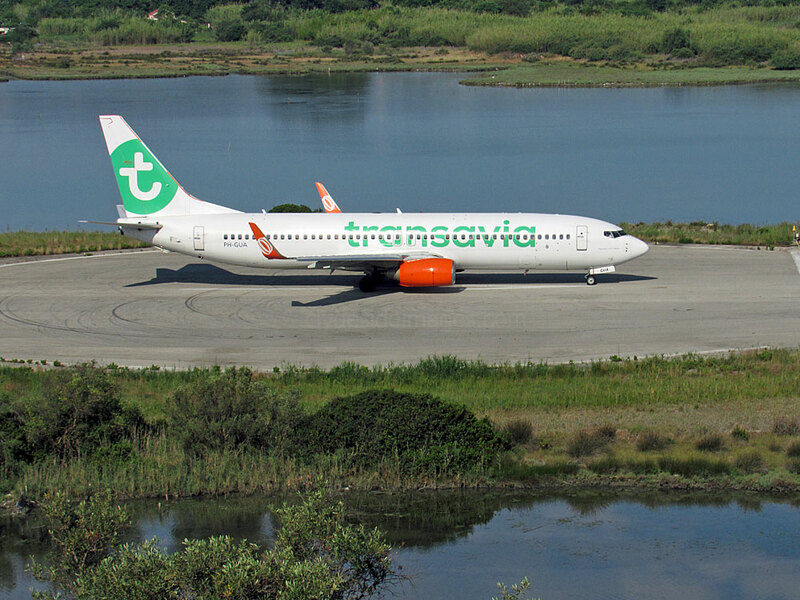 Transavia Boeing 737-8K2(WL) PH-HSA in `Sunweb I love summer` livery. 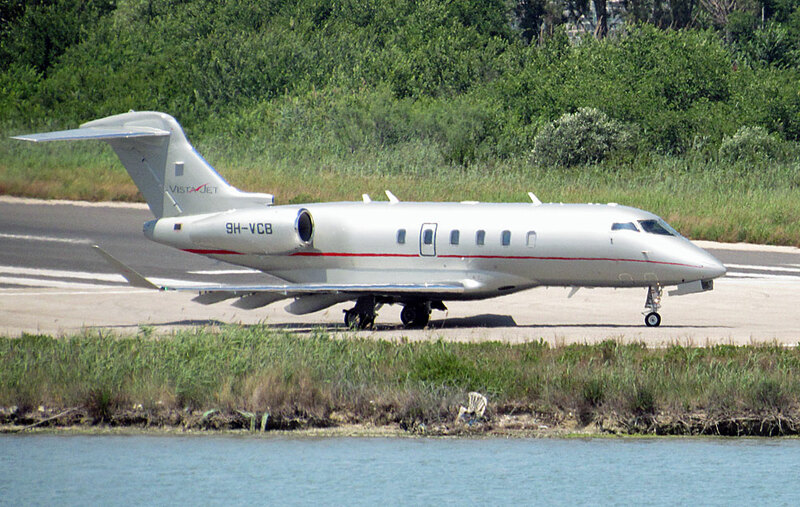 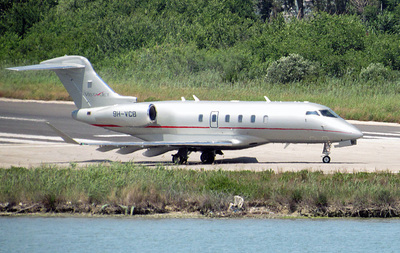 VistaJet Bombardier BD-100-1A10 Challenger 300 9H-VCB. 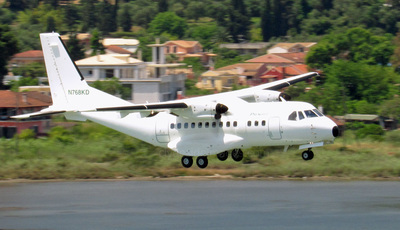 Prescott Support CASA CN-235-300 N768KD. 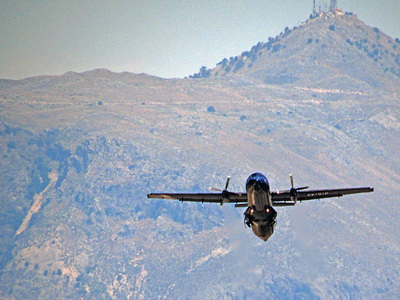 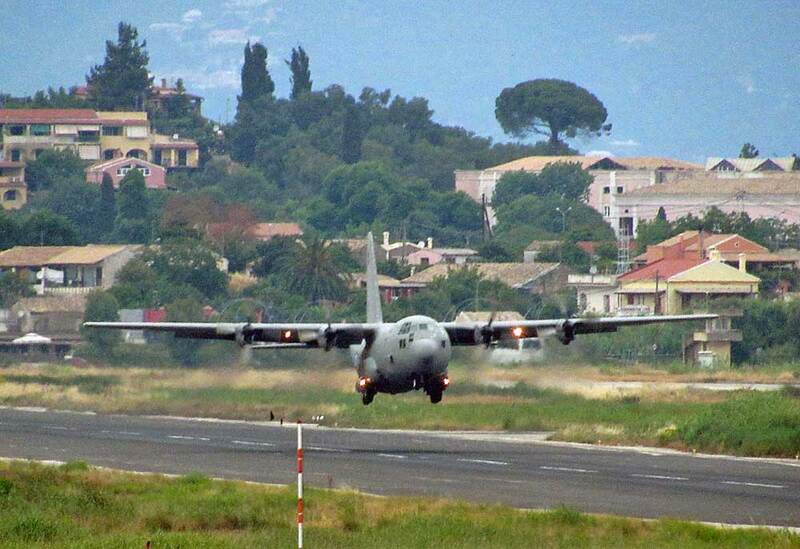 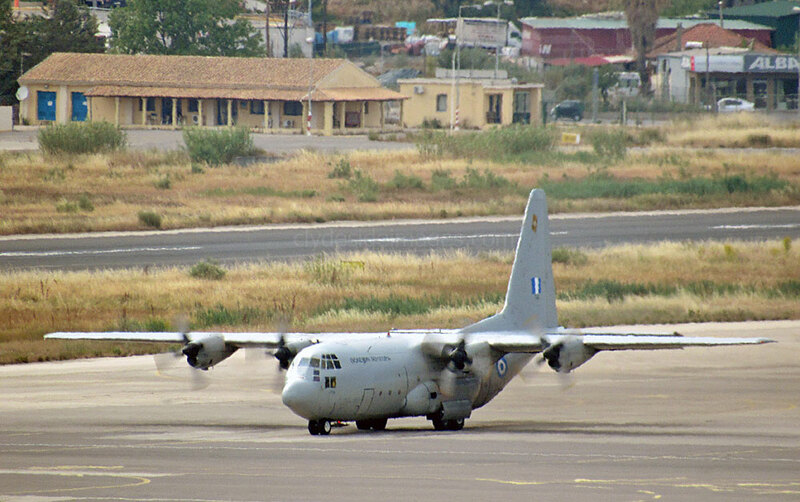 ​Military movements were limited to a single Hellenic Air Force C-130H, training on two separate days. 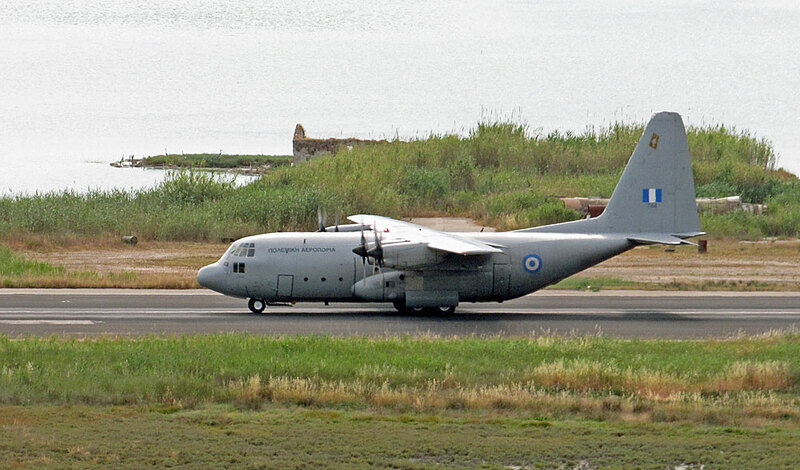 The first Herc, bearing the serial number 744, appeared during the afternoon of Thursday 4th. 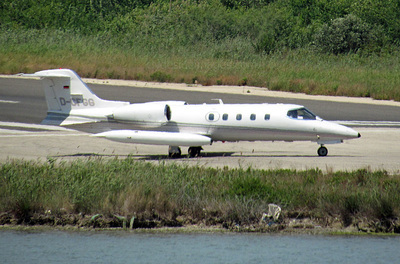 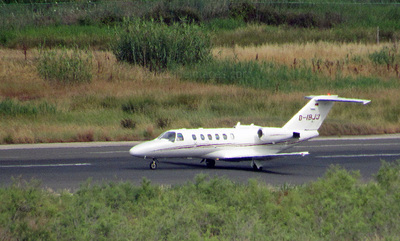 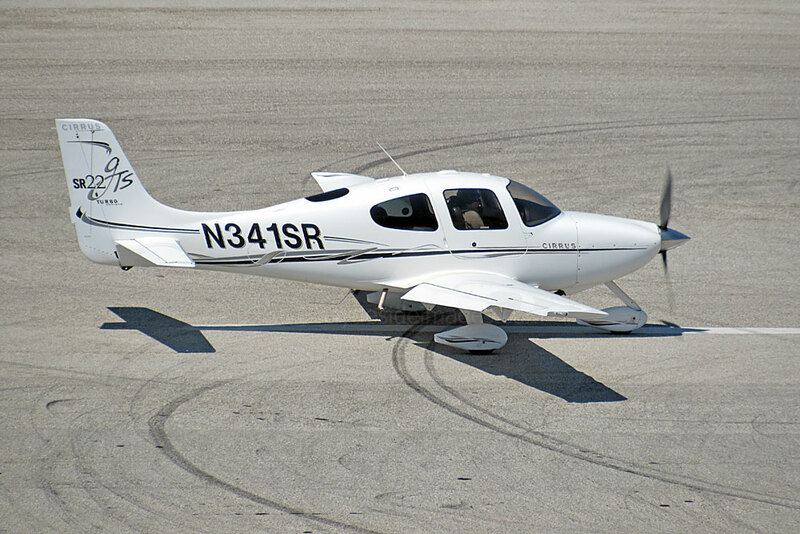 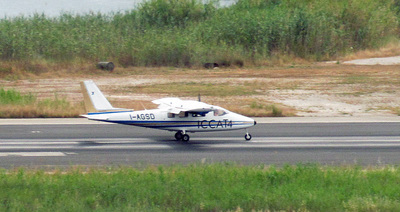 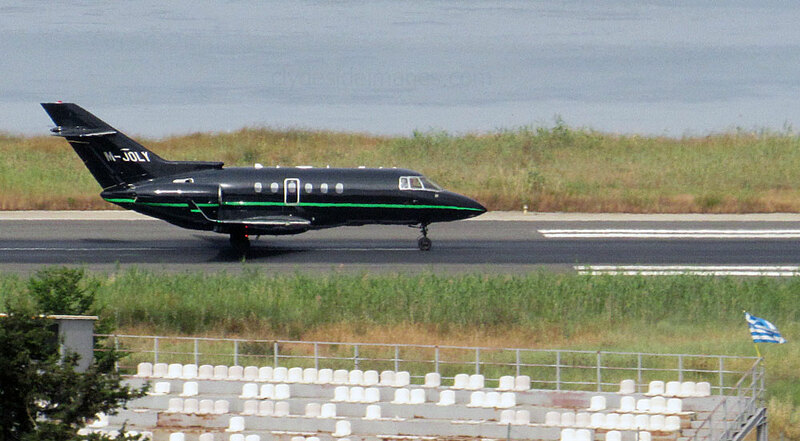 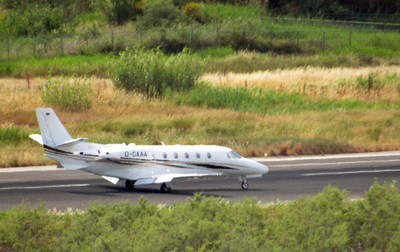 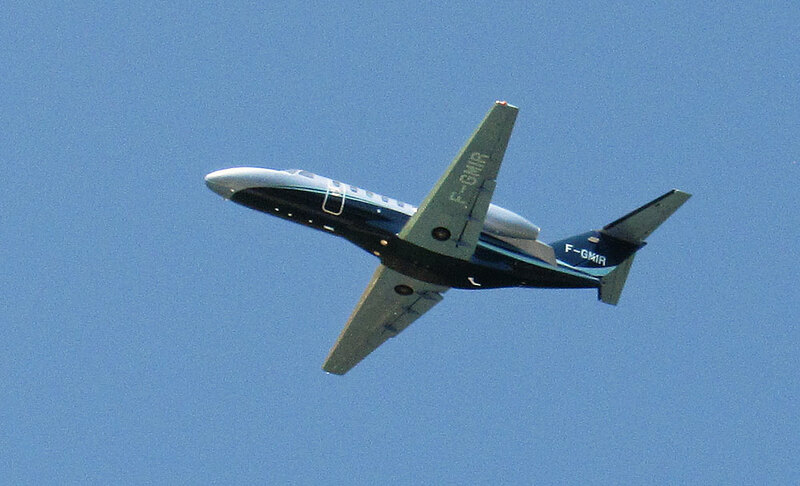 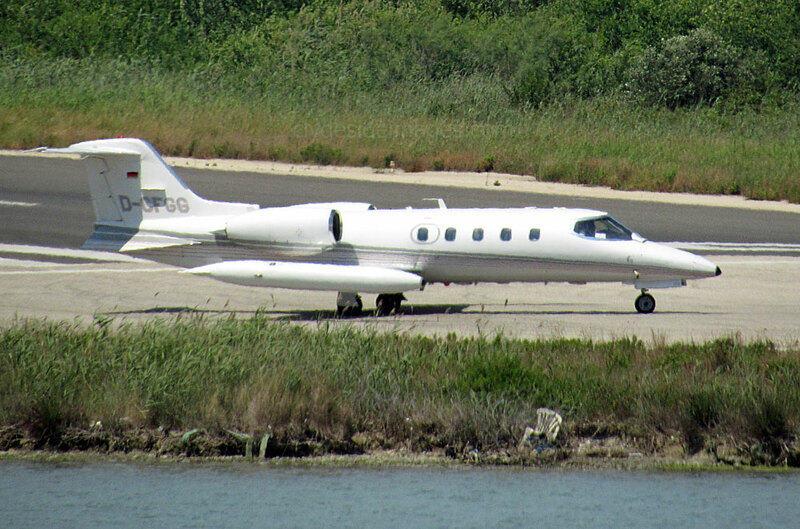 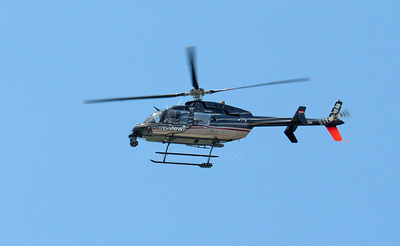 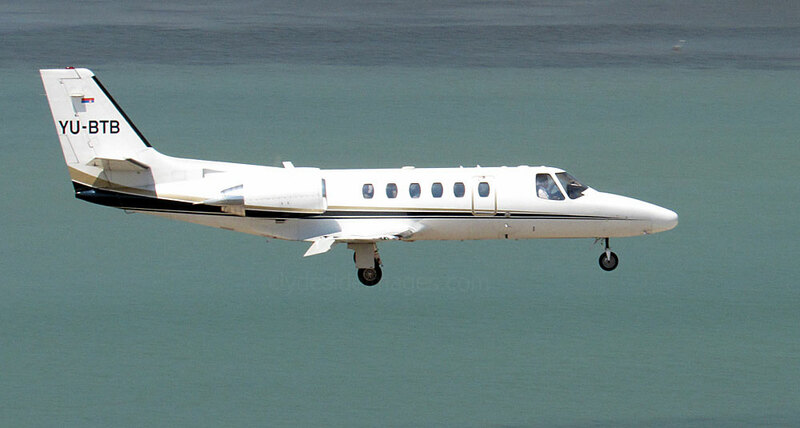 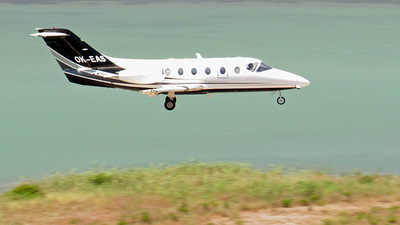 Another, possibly the same aircraft, was back on Sunday 7 June. 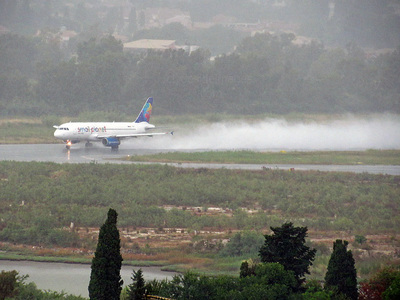 They carried out several touch-and-goes before landing briefly then returning to the air.